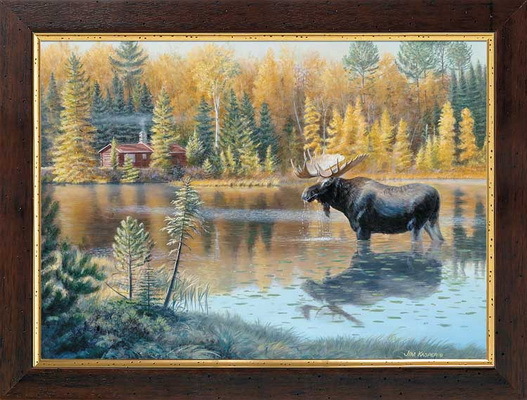 This great piece fits perfectly beside a pool, on the back deck, or in the man cave. 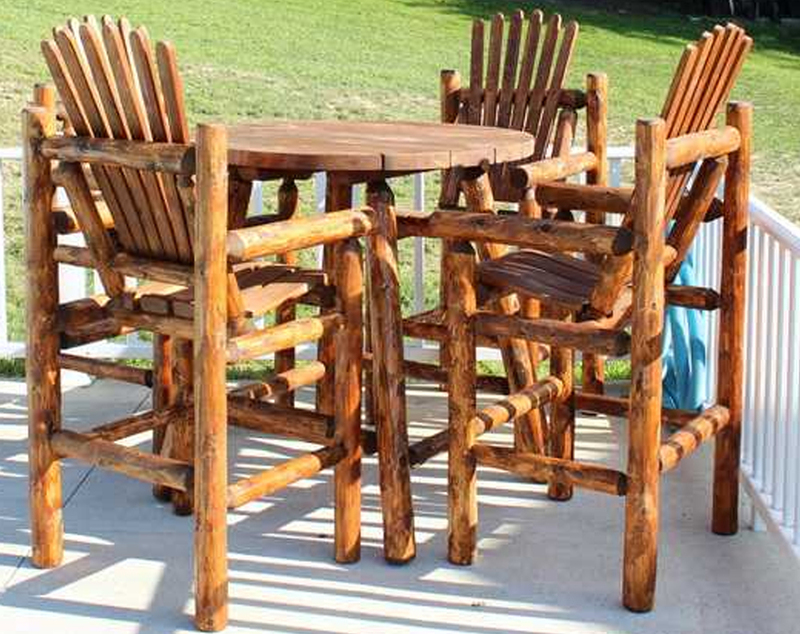 Comes with four captains chairs and a 42″ round Pub Table. 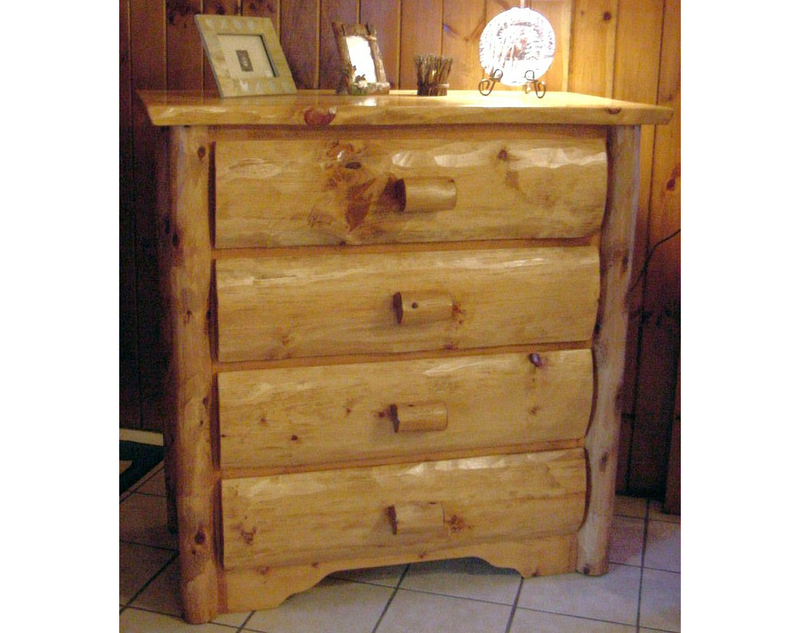 Constructed of white cedar and a white pine top on the table. This product may be used indoors or out, please choose stain color accordingly. Table height is 43″. Call us at (866) 744-9913 for more information and shipping. Please see our [Additional Information] menu to view interior colors. Solid white cedar construction; Instructions and hardware included. Ships in 3-5 days. Shipped in two boxes with some assembly required. Call us at (866) 744-9913 for more information and for shipping options. 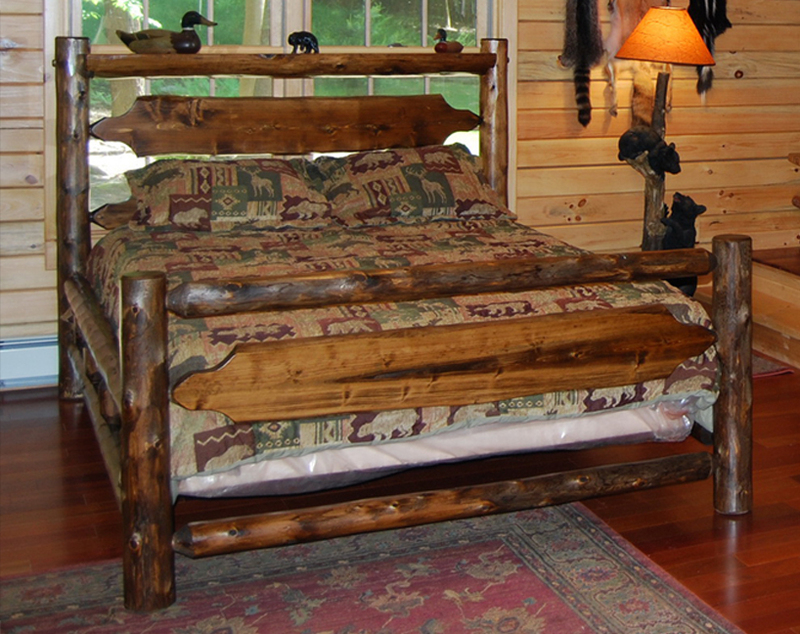 All beds are mortise and tenon construction. 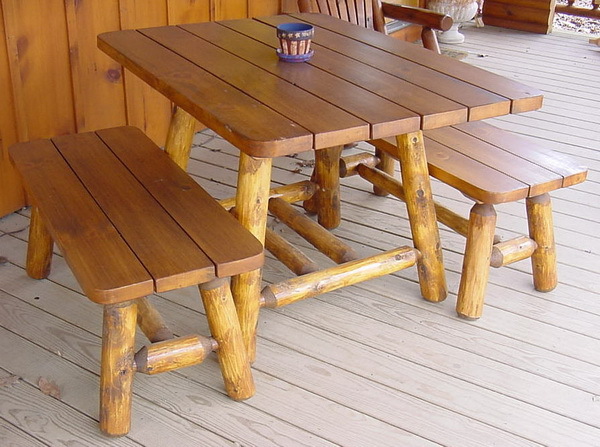 Thick half-log slats tenoned into each rail for years of reliable, rugged good looks. Shipped partially assembled as four pieces. Available unfinished or finished. We finish with Minwax Colors, and seal with satin laquer finish. Call us for more information on ordering this product at 866-744-9913. 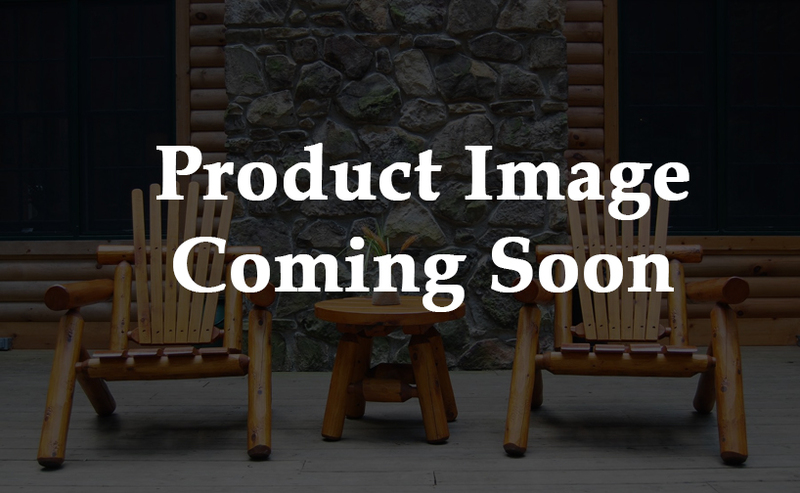 Click to view interior stain colors for this product. 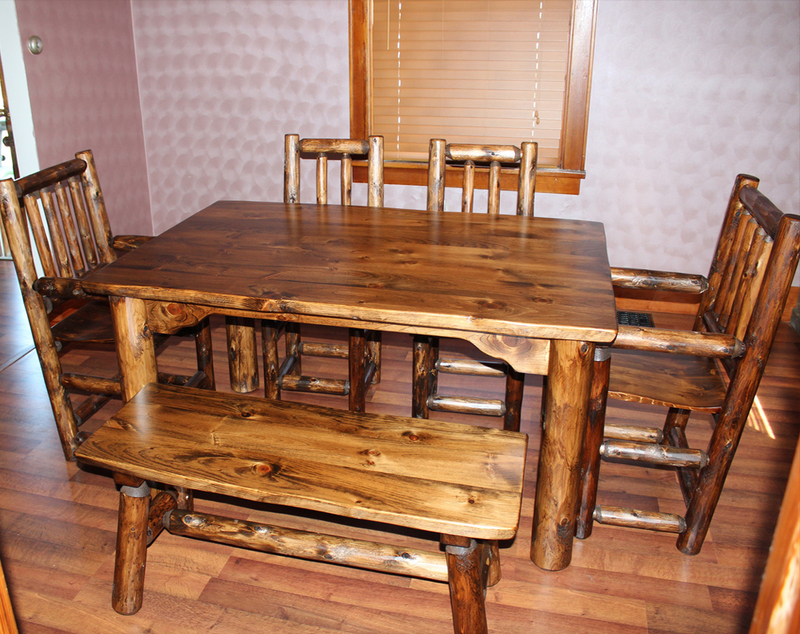 Constructed of Sycamore and Juniper this table and chairs will be the centerpiece in your dining area. 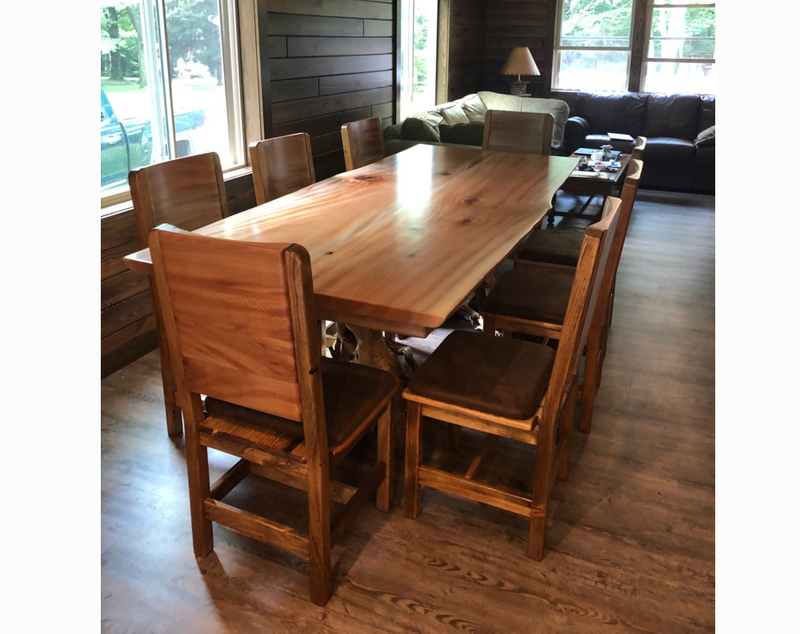 Table comes with 8 chairs. Available unfinished or have us finish it with Minwax stain color of your choice and multiple coats of satin lacquer. Please give us a call to discuss shipping options at (866) 744-9913. Custom tables are also available. Give our knowledgeable sales team a call today! 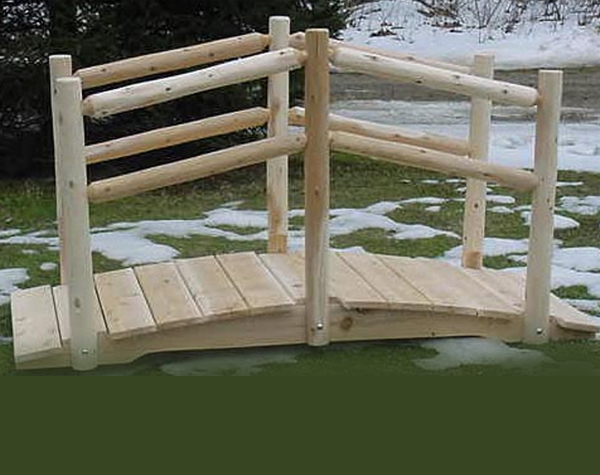 Solid white cedar construction; Instructions and hardware included.Usually ships in 1-2 weeks. Shipped in two boxes with some assembly required. 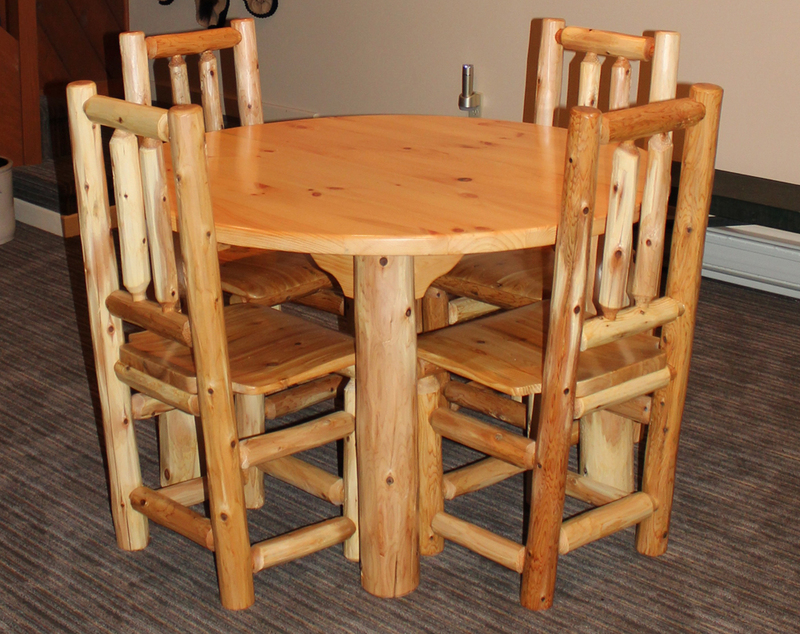 Constructed of White Cedar, this breakfast nook will be the centerpiece in any kitchen. Table comes with 2 bench seats. 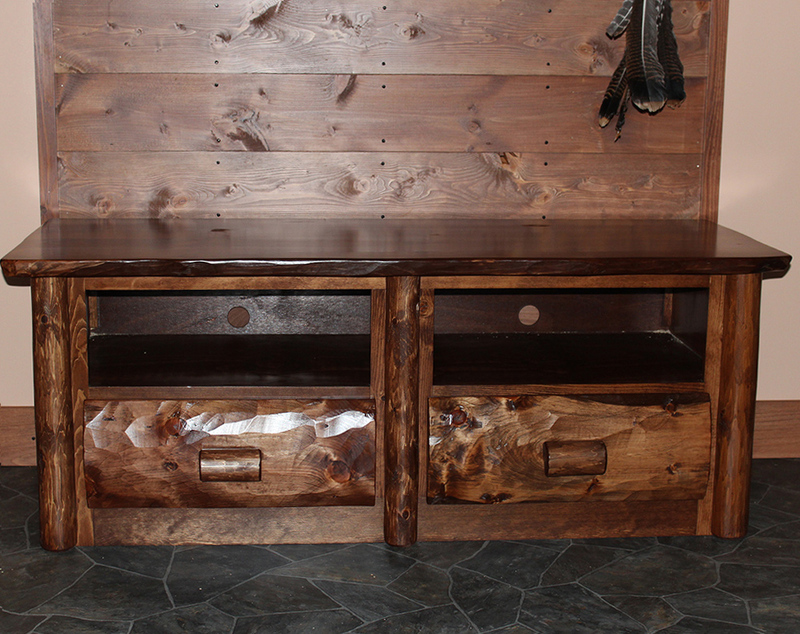 Available unfinished or have us finish it with Minwax stain color of your choice and multiple coats of satin lacquer. Please call us at (866) 744-9913 for more information or for shipping. 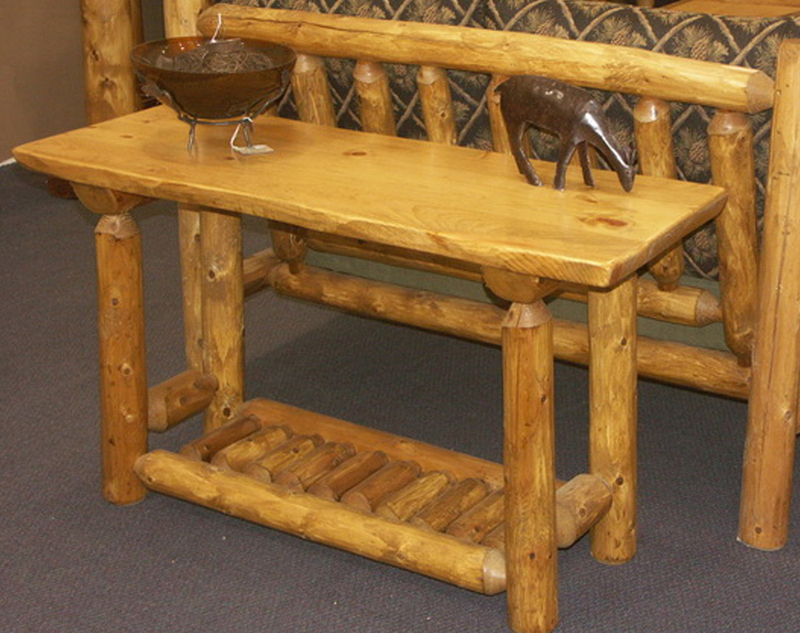 Custom tables are available, give our knowledgeable sales team a call today! 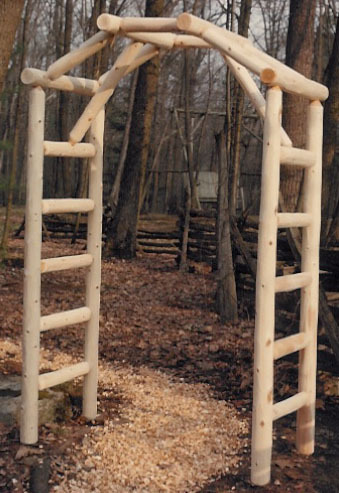 Solid white cedar construction; Instructions and hardware included. Ships in 3-5 days. Shipped in two boxes with some assembly required. All beds are mortise and tenon construction. Thick half-log slats tenoned into each rail for years of reliable, rugged good looks. Shipped partially assembled as four pieces. Available unfinished or finished. We finish with Minwax Colors, and seal with satin lacquer finish. Call us at (866) 744-9913 for more information and shipping. Please view our interior colors. 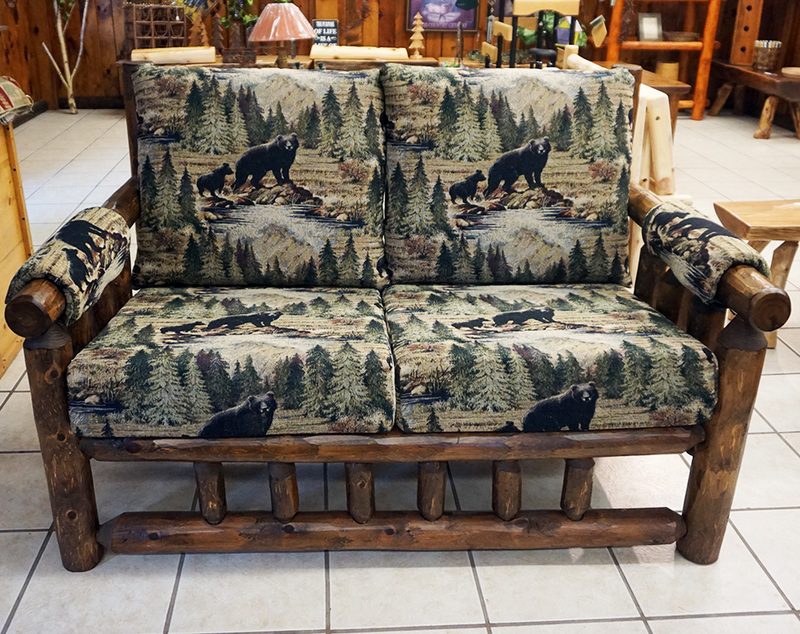 This loveseat will look great in front of any fireplace. 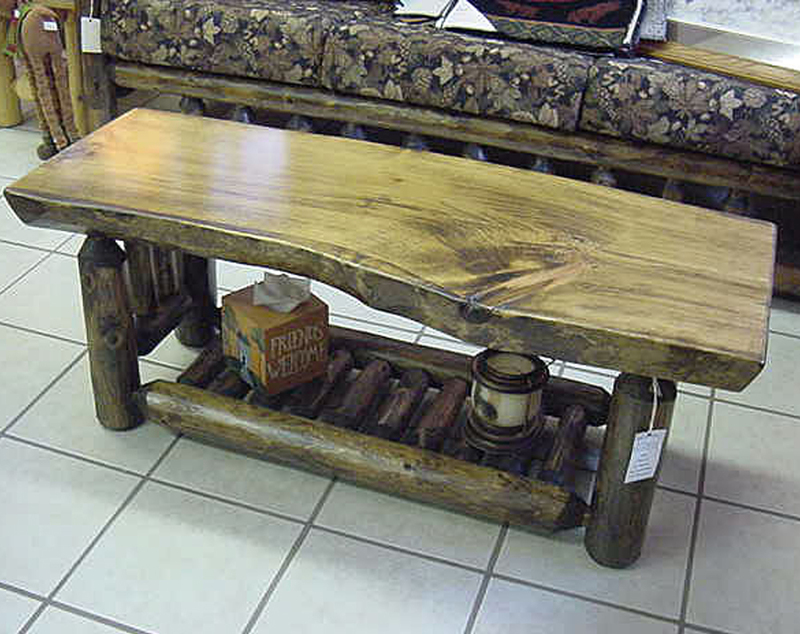 Your choice of fabrics gives you the option of being formal or rustic – either way, your family will enjoy this piece of rugged furniture for generations. Available unfinished or finished. We finish with Minwax™ Colors, and seal with satin laquer finish. Please go to www.siscovers.com to choose your fabric then give us a call for a customized shipping quote. 1-866-744-9913. View interior colors. Love to sit under the shade tree and read a good book? 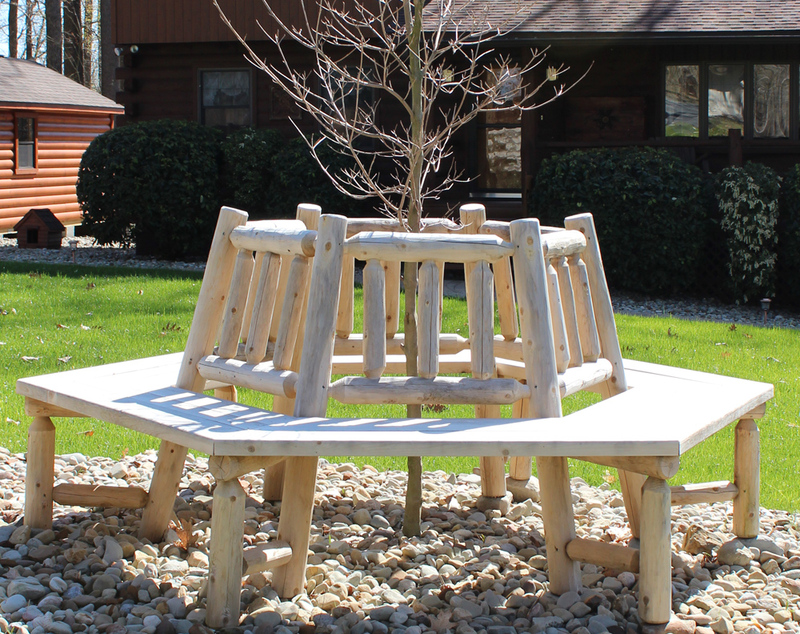 This round bench would make any yard more inviting. Purchase finished or unfinished. Please call for shipping information (866) 744-9913. 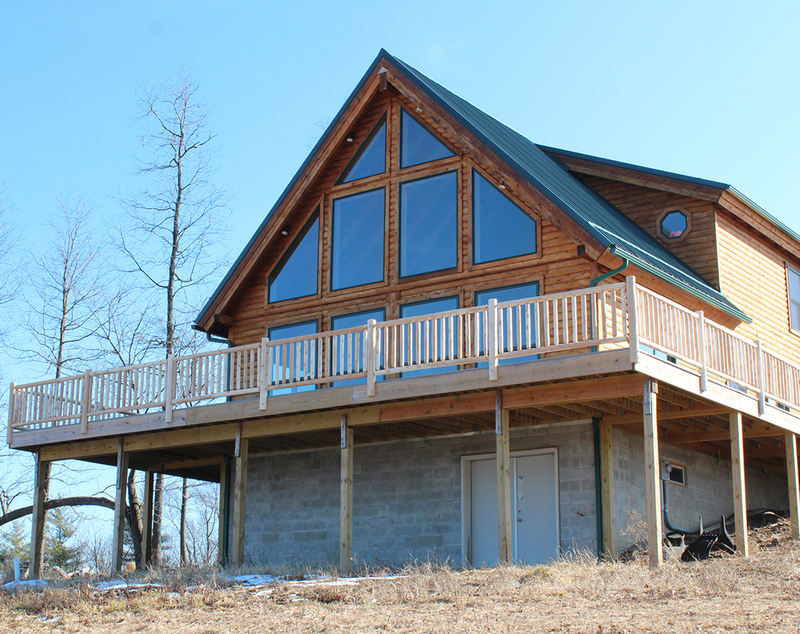 Please view our exterior stain choices. 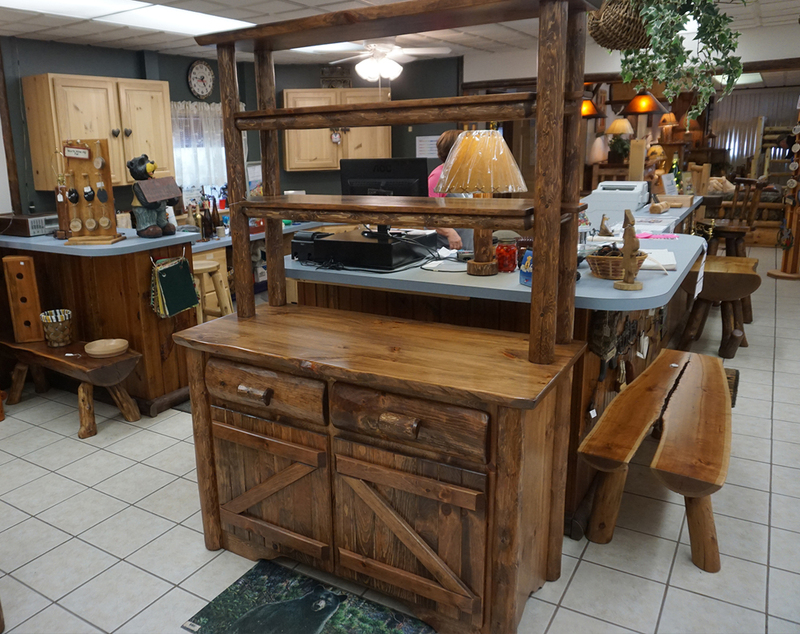 Our craftsmen can make almost any wood product that you would want for your kitchen or cabin project. 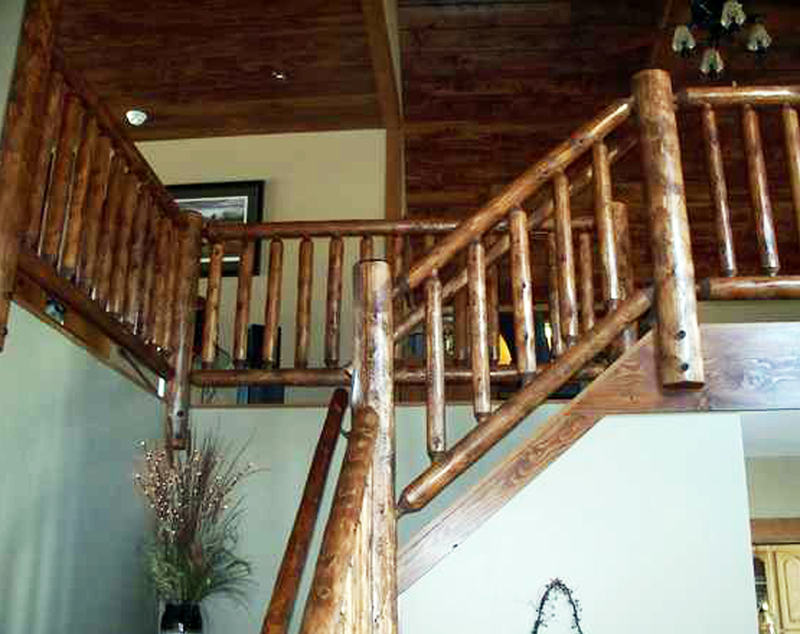 Give us a call and we can talk more about how to add beautiful wood features into your home. 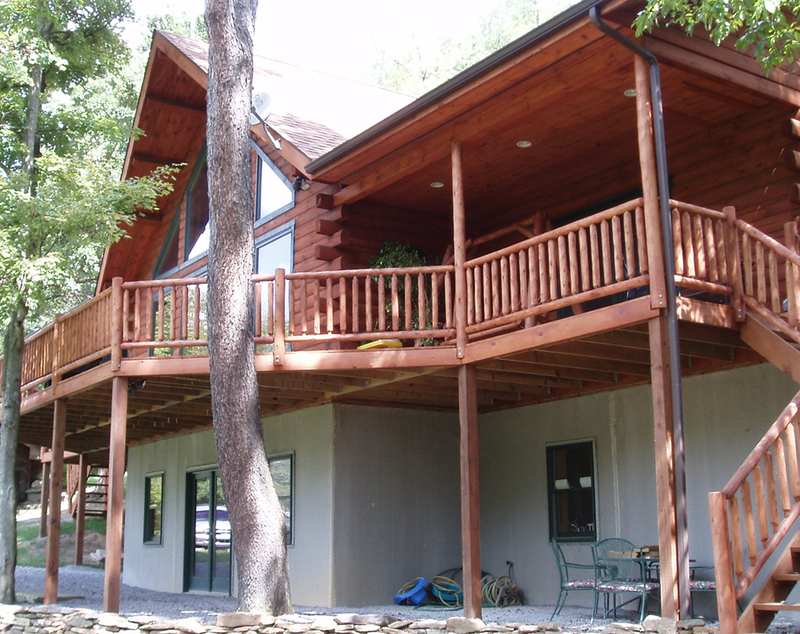 Please call us at (866) 744-9913 for all railing styles and colors. 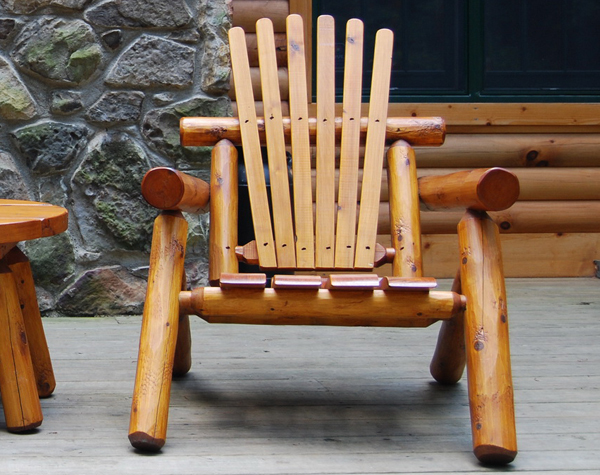 This northern white cedar double log rocker is the perfect mate for our single rocker and also is designed with comfort in mind. 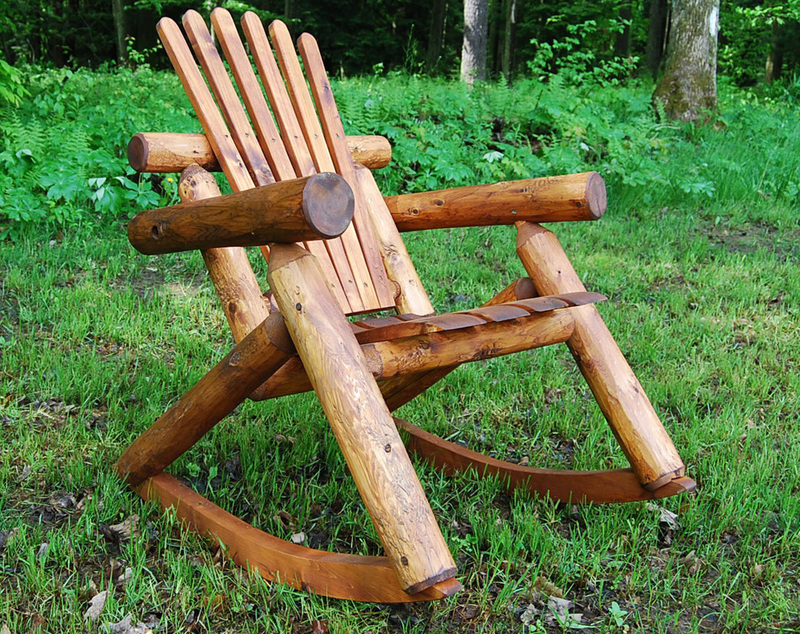 The natural qualities of white cedar logs are resistant to both rot and insect damage and with minimal upkeep this chair will last a lifetime. We provide a five year warranty on construction for this item. Usually ships in 1-2 weeks. Call us at (866) 744-9913 for more information and shipping. This product ships partially assembled and includes zinc hardware and instructions. Approx. assembly time is 30 min. 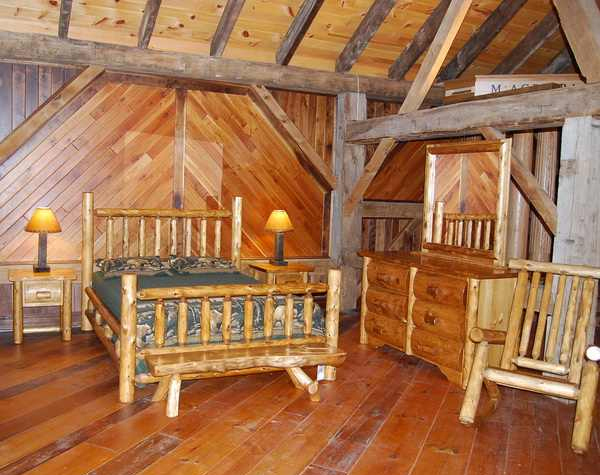 Due to natural log construction measurements vary +/- an inch. 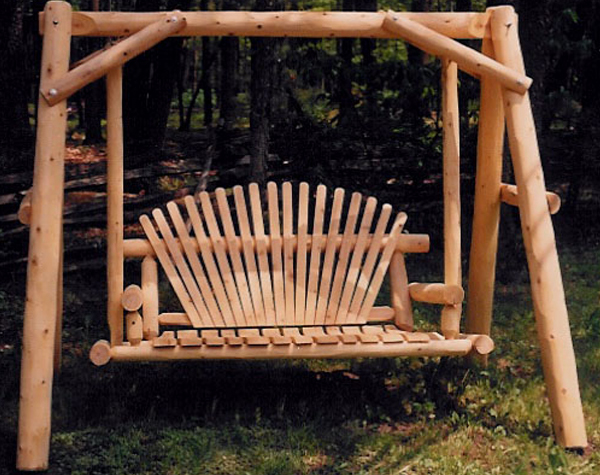 This rustic log swing, made from northern white cedar, provides a solid construction, heirloom quality piece of outdoor furniture that is naturally rot and insect resistant. The contoured seat and slat back provides the perfect place to spend quality time with family and friends. We allow a five year warranty on construction. Usually ships in 1-2 weeks. Instructions and hardware included. Can be purchased finished or unfinished. Please call us at (866) 744-9913 for more information or shipping. This traditional raiing was stained to match the interior. 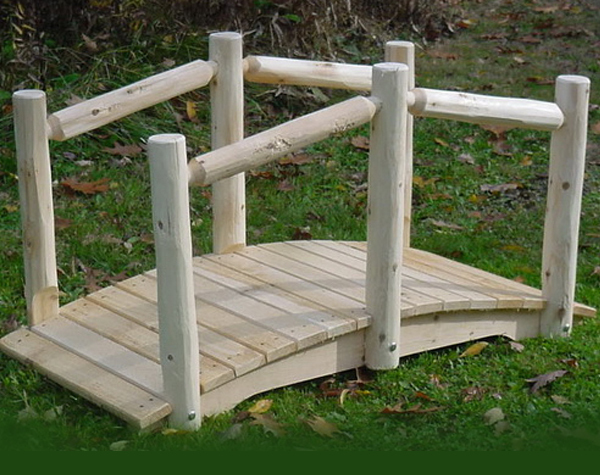 We used notched post and added a handrail to meet code. Please call for more information at 1-866-744-9913. Solid white cedar construction; Instructions and hardware included. Usually ships in 1-2 weeks. Shipped in two boxes with some assembly required. 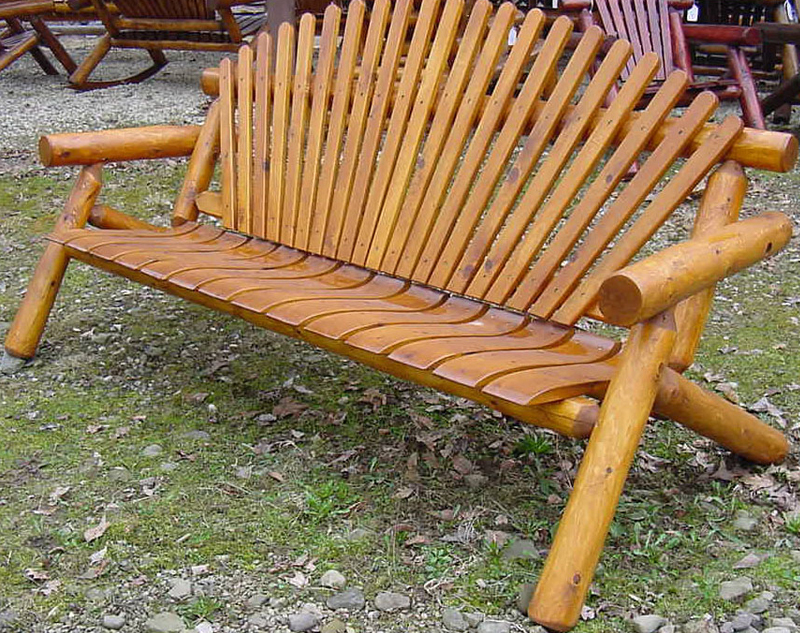 The design of this northern white cedar log rocker is based on one thing, comfort. 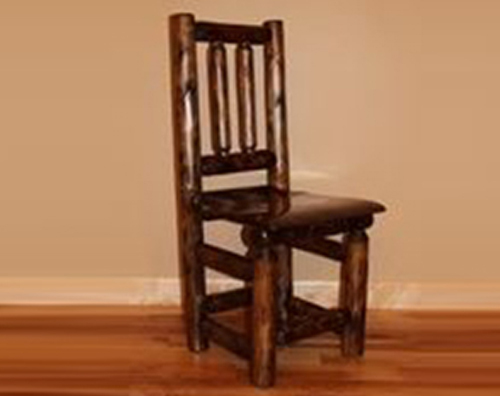 The natural qualities of white cedar logs are resistant to both rot and insect damage and with minimal upkeep, this chair will last a lifetime. 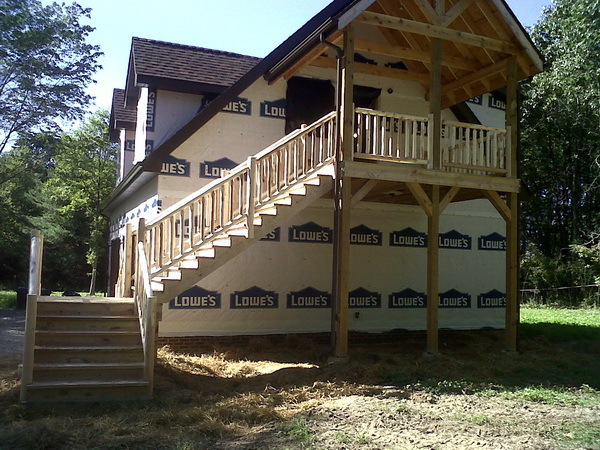 We provide a five-year warranty on construction. Usually ships in 1-2 weeks. Call us for more information on ordering this product at 866-744-9913. 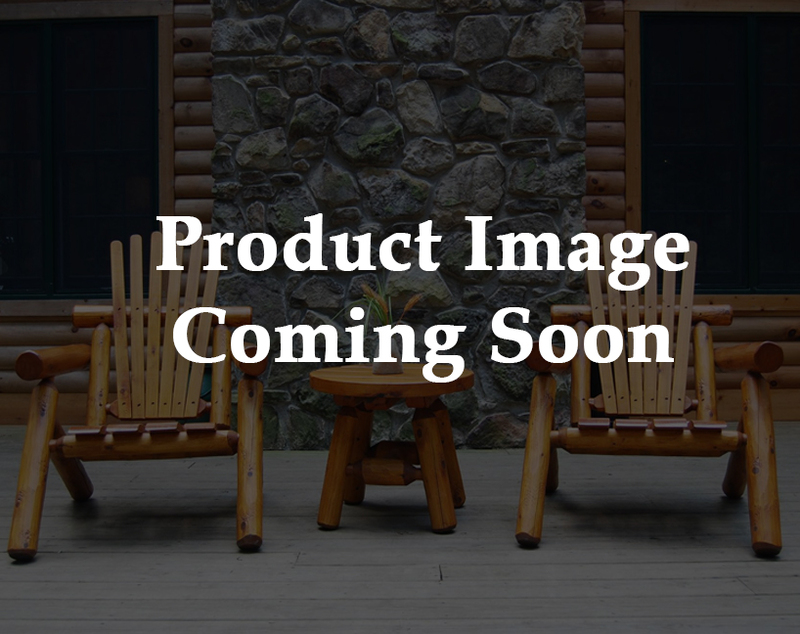 Assembled Dimensions: 32″ W x 37″ D x 41″ H.
Seat: 22″W x 17″ D x 29″ H (Seat Height approx. 19″ from ground). Ships in 1 box via UPS Ground. 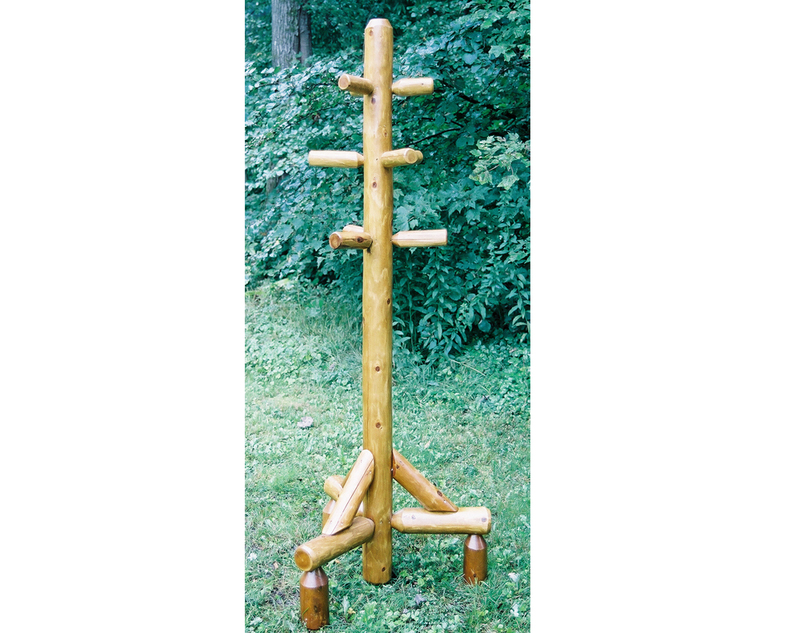 This rustic log hall tree is made of solid wood construction. It is naturally rot and insect resistant. We allow a five year warranty on construction. Usually ships in 1-2 weeks. Instructions and hardware included. Call us at (866) 744-9913 for more information. 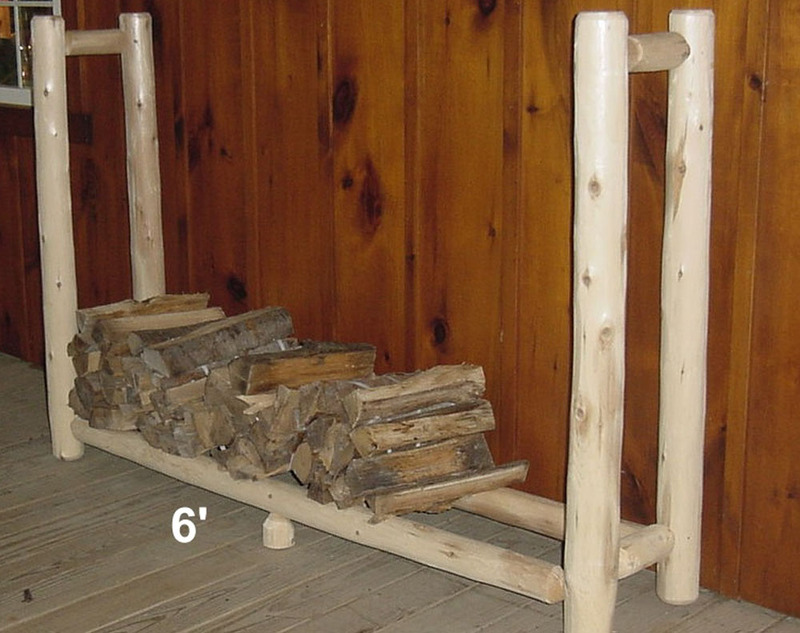 This rustic log firewood rack would be great addition to any cabin. 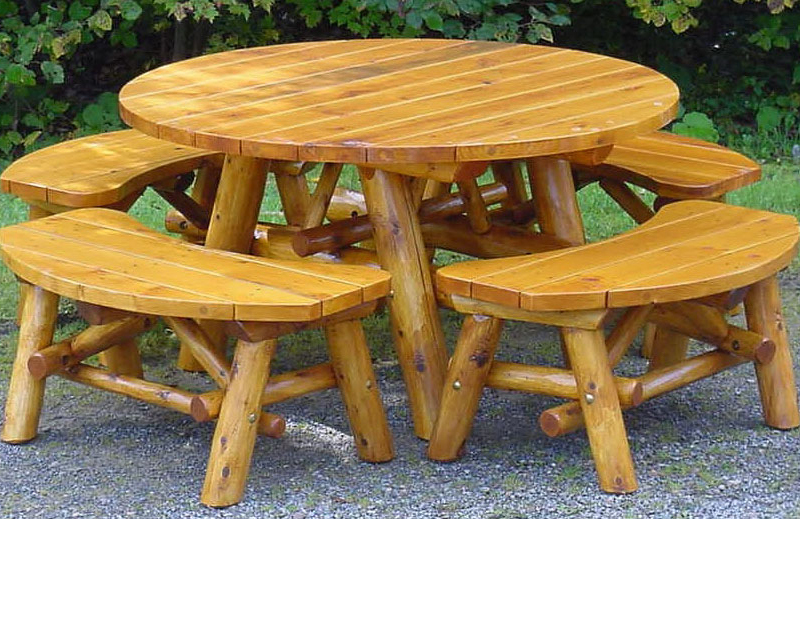 It is made of solid wood construction and is naturally rot and insect resistant. We allow a five year warranty on construction. Usually ships in 1-2 weeks. Instructions and hardware included. Call us at (866) 744-9913 for more information. Sturdy natural oak construction. 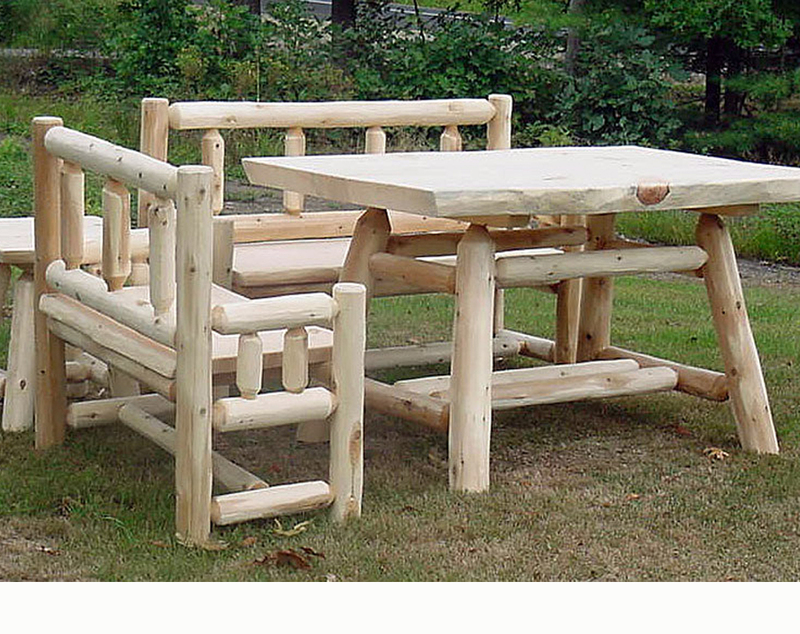 Table comes with two side benches. Instructions and hardware included. Call for more information at (866) 744-9913. 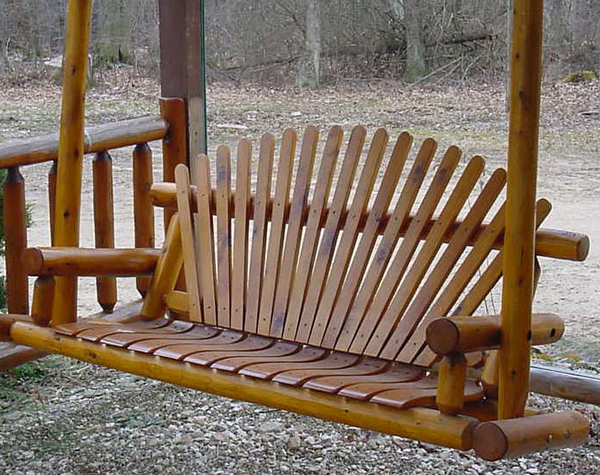 This rustic log glider is made of solid construction and is an heirloom quality piece of outdoor furniture that is naturally rot and insect resistant. We allow a five year warranty on construction. Usually ships in 1-2 weeks. Instructions and hardware included. Call us at (866) 744-9913 for more information. 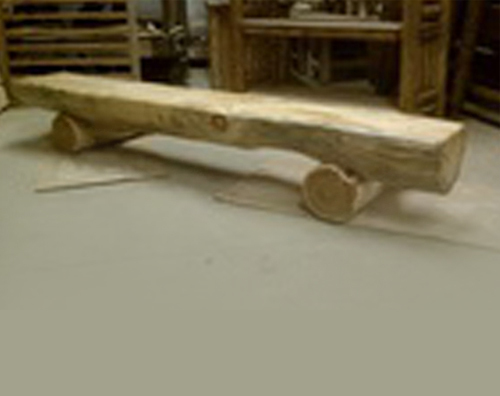 This rustic log swing provides a solid construction and is an heirloom quality piece of outdoor furniture that is naturally rot and insect resistant. We allow a five year warranty on construction. Usually ships in 1-2 weeks. Instructions and hardware included. 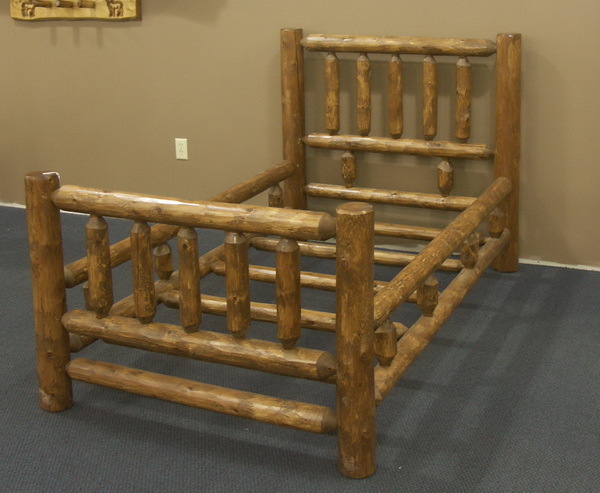 This rustic log porch swing provides a solid construction and is an heirloom quality piece of outdoor furniture that is naturally rot and insect resistant. The swing is similar is a 5 foot porch swing. We allow a five year warranty on construction. Usually ships in 1-2 weeks. Instructions and hardware included. 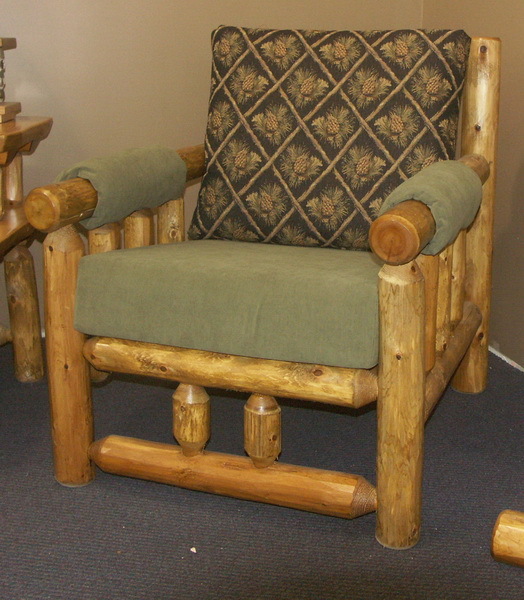 The design of this popular northern white cedar log chair keeps customers coming back again and again. 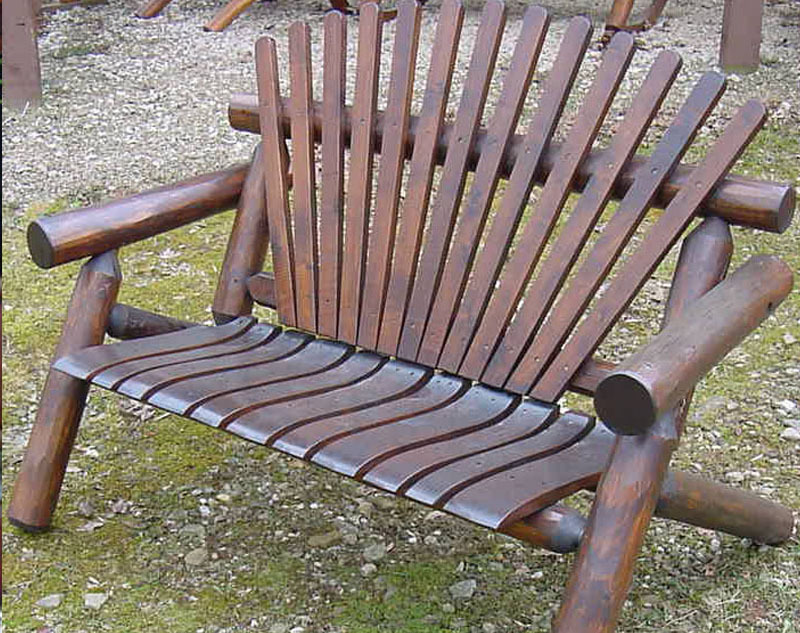 This is the perfect complement to any patio, deck or fire pit and will provide many years of lasting comfort. 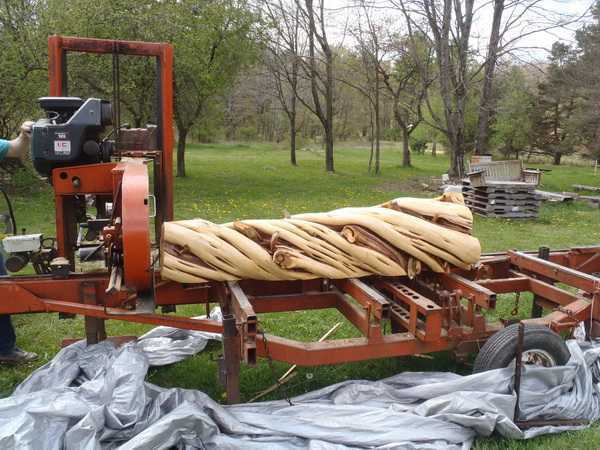 The natural qualities of the cedar logs are resistant to both rot and insect damage with minimal upkeep. We provide a five-year warranty on construction. Usually ships in 1-2 weeks. Instructions and hardware included. Please see our interior colors. A perfect match for our chair. Available unfinished or finished. We finish with Minwax™ Colors, and seal with satin laquer finish. Please go to www.siscovers.com to choose your fabric then give us a call for a customized shipping quote. Call us at (866) 744-9913 for more information and shipping. 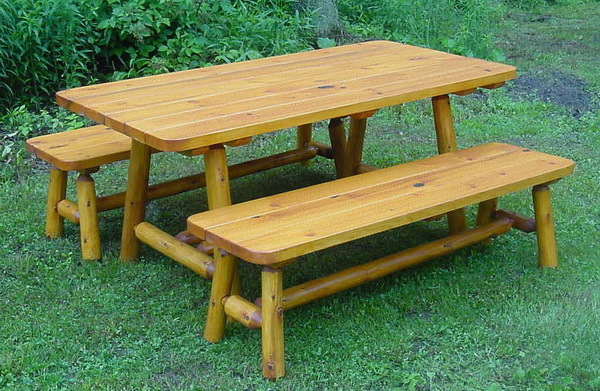 Sturdy white cedar construction, table comes with two side benches; Instructions and hardware included. Call us at (866) 744-9913 for more information and shipping. Sturdy white cedar log construction. 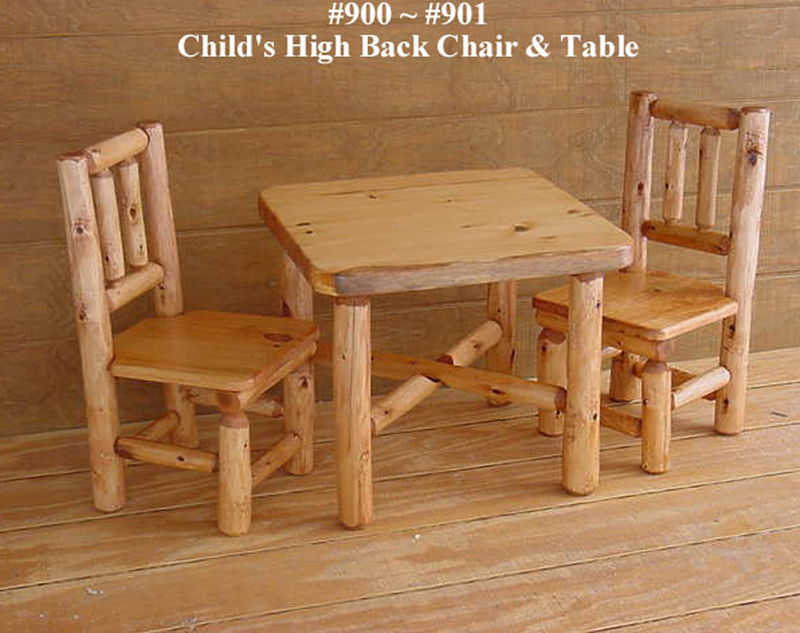 Table comes with two side benches; Instructions and hardware included. Call us at (866) 744-9913 for more information and shipping. 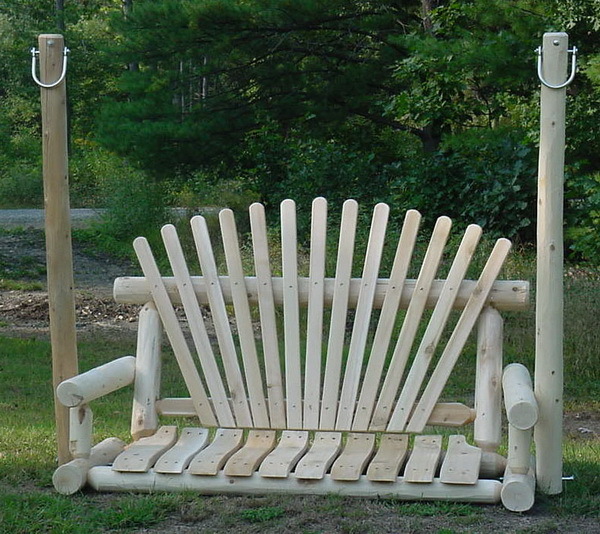 This rustic log swing provides a solid construction and is an heirloom quality piece of outdoor furniture that is naturally rot and insect resistant. 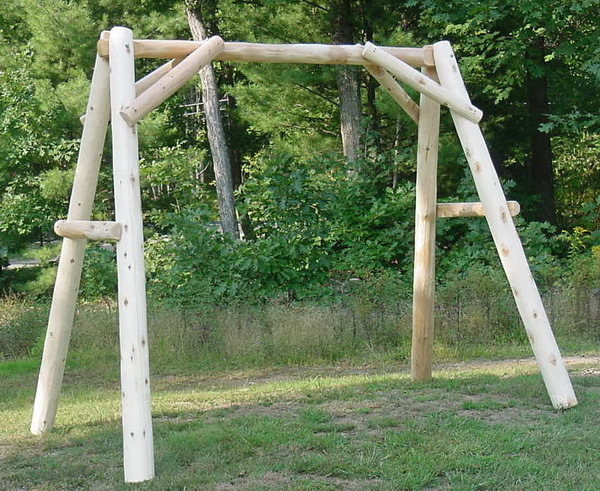 The swing is similar is a 5 foot A-frame design. We allow a five year warranty on construction. Usually ships in 1-2 weeks. Instructions and hardware included. A larger version of the loveseat the 6′ bench will seat three. 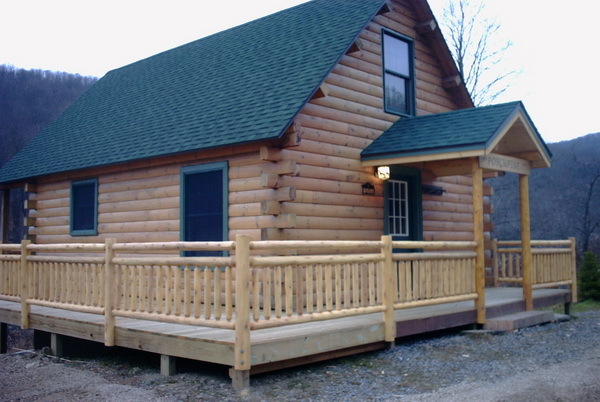 The natural qualities of the cedar logs are resistant to both rot and insect damage with minimal upkeep. We provide a five year warranty on construction. Usually ships in 1-2 weeks. Instructions and hardware included. 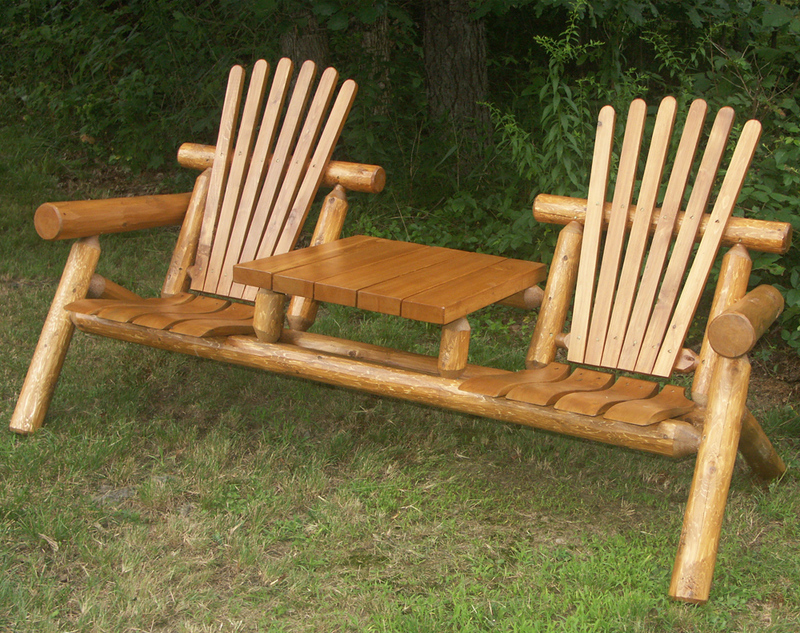 This rustic log glider is made of solid oak construction and is an heirloom quality piece of outdoor furniture. It is naturally rot and insect resistant. We allow a five year warranty on construction. Usually ships in 1-2 weeks. Instructions and hardware included. 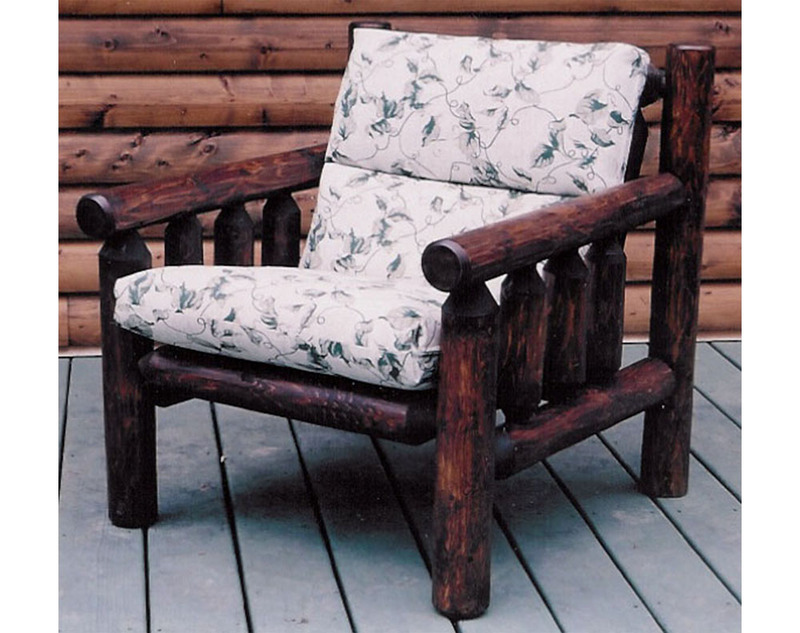 This rustic log porch swing, made from northern white cedar, provides a solid construction, heirloom quality piece of outdoor furniture that is naturally rot and insect resistant. The contoured seat and slat back provide the perfect place to spend quality time with family and friends. We allow a five-year warranty on construction. Usually ships in 1-2 weeks. Measures 98″ X 50″ X 74″. Instructions and hardware included. Solid white cedar construction; Instructions and hardware included. Ships in 3-5 days. All beds are mortise and tenon construction. Thick half-log slats tenoned into each rail for years of reliable, rugged good looks. Shipped partially assembled as four pieces. Available unfinished or finished. We finish with Minwax Colors, and seal with satin laquer finish. Call us at (866) 744-9913 for more information and shipping. Solid White Cedar Log construction. Measures 98″ X 50″ X 74″. Use for most 5′ swings. Instructions and hardware included. Usually ships in 1-2 weeks. Call us at (866) 744-9913 for more information and shipping. 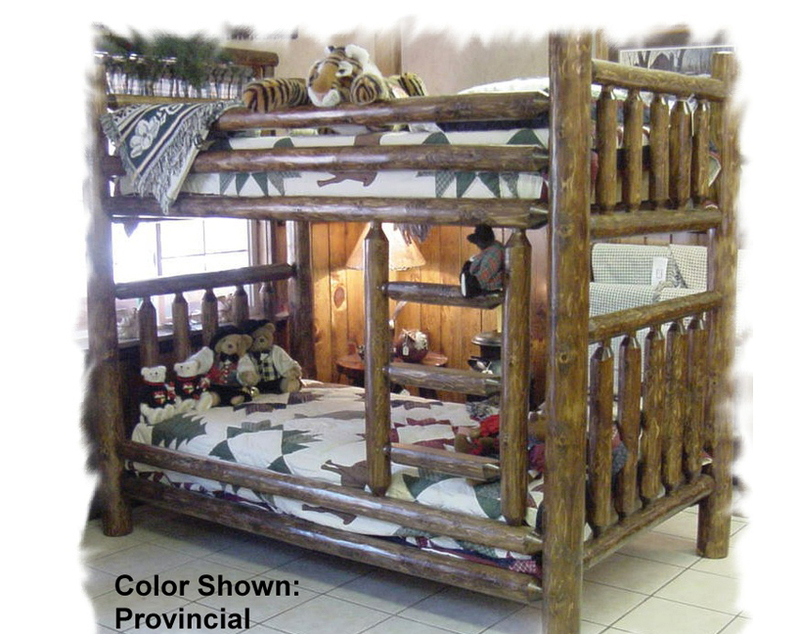 The same style as all of our Traditional beds with a 57″ tall headboard. All beds are mortise and tenon construction. Thick half-log slats tenoned into each rail for years of reliable, rugged good looks. Shipped partially assembled as four pieces. Available unfinished or finished. We finish with Minwax Colors, and seal with satin laquer finish. Call us at (866) 744-9913 for more information and shipping. Call us for more information on ordering this product. 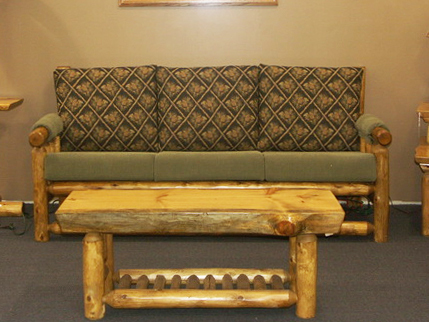 This living room piece is sure to be the center of attention in any living room or game room. Built to last. 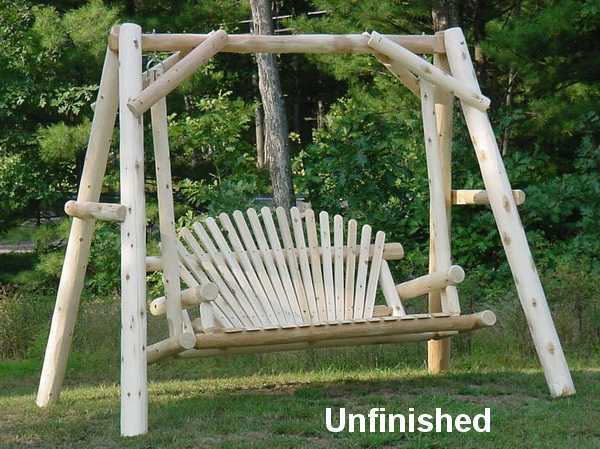 Available unfinished or have us finish it with Minwax stain color of your choice and multiple coats of satin lacquer. Call us at (866) 744-9913 for more information and shipping. This will be the centerpiece of your living room. Cedar log framework with a white pine slab top. 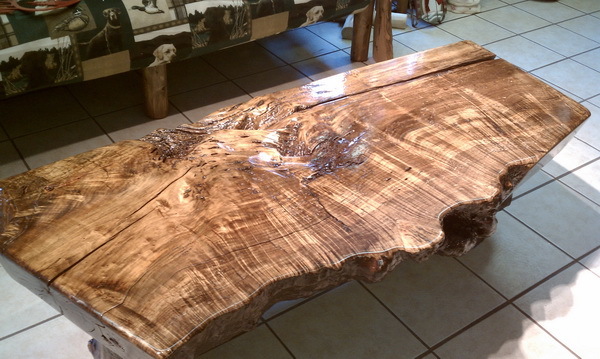 Each one is unique, choose unfinished or pick one of the Minwax colors to really bring out the beauty of this table. Available unfinished or finished. We finish with Minwax™ Colors and seal with satin lacquer finish. Call us at (866) 744-9913 for more information and shipping. This will be the centerpiece of your living room. 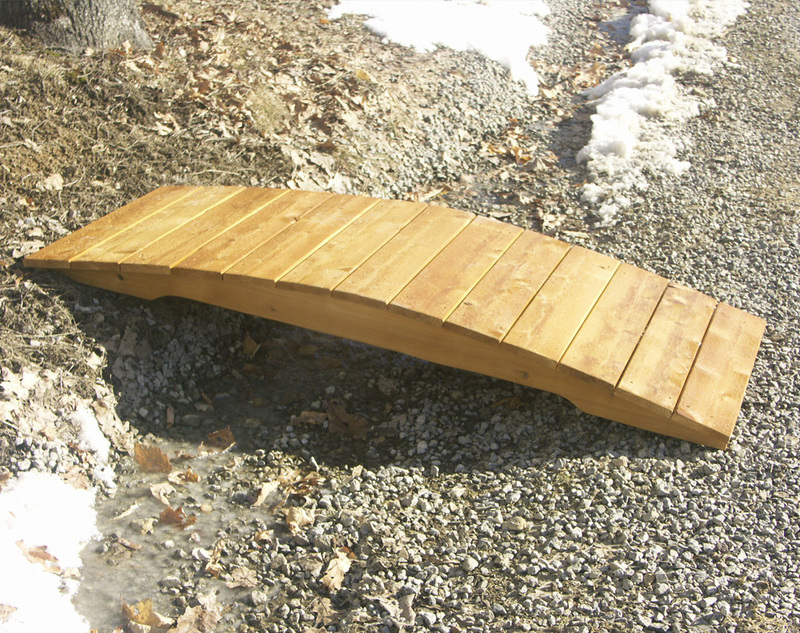 Cedar log framework with a white pine slab top. Each one is unique, choose unfinished or pick one of the Minwax colors to really bring out the beauty of this table. (17x19x48) width will vary slightly. Available unfinished or finished. We finish with Minwax™ Colors and seal with satin lacquer finish. Call us at (866) 744-9913 for more information and shipping. Approx. assembly time is: ships assembled. 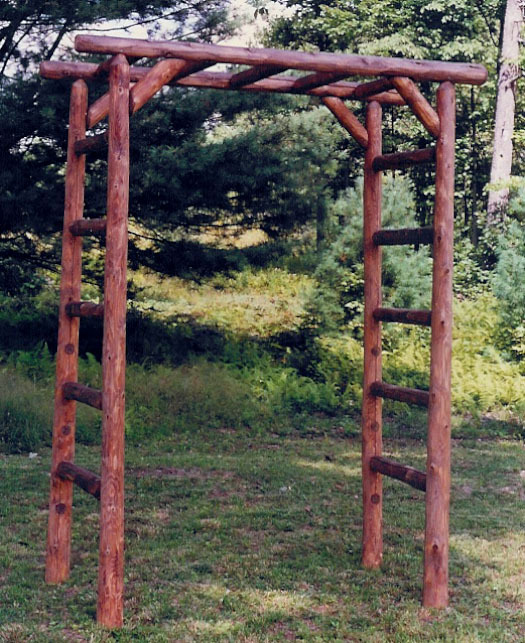 4′ Frame only made from White Cedar Logs for sturdy construction. 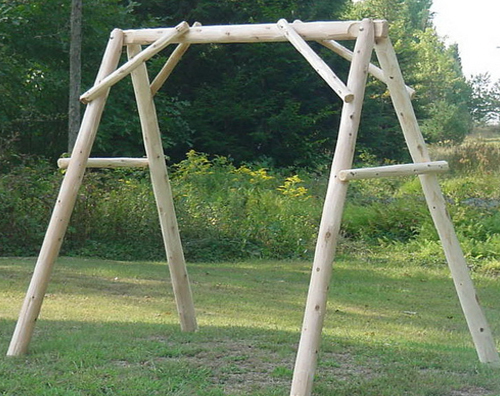 Measures 87″x54″x67″ and fits most 4′ swings. Instructions and hardware included. Usually ships in 1-2 weeks. Please give us a call for more information about this product or to discuss shipping options at (866) 744-9913. Solid white cedar construction; Instructions and hardware included. Usually ships in 1-2 weeks. Solid log framework. We finish with Minwax Colors and seal with satin laquer finish. Call us at (866) 744-9913 for more information and shipping. 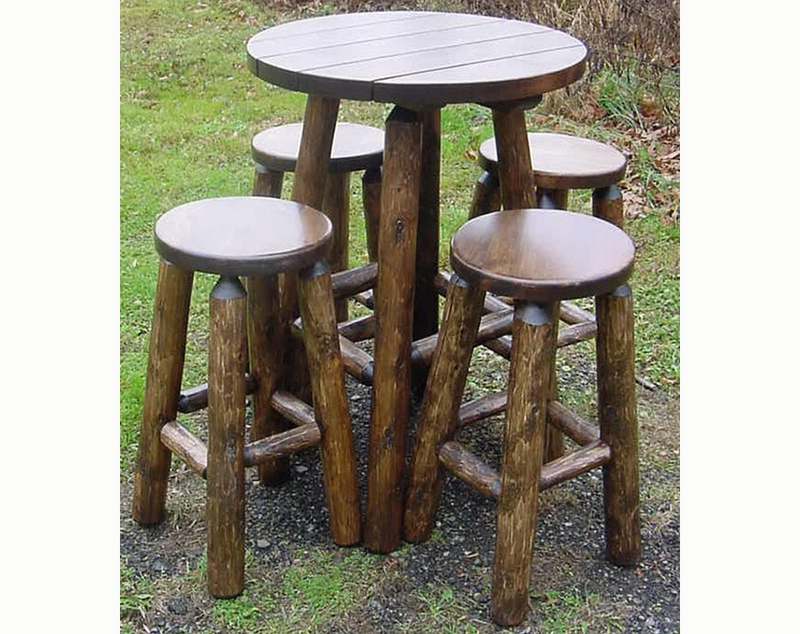 This combines our standard pub table and 4 31″ bar stools. Available to be finished interior or exterior use. Call us at (866) 744-9913 for more information and for shipping options. 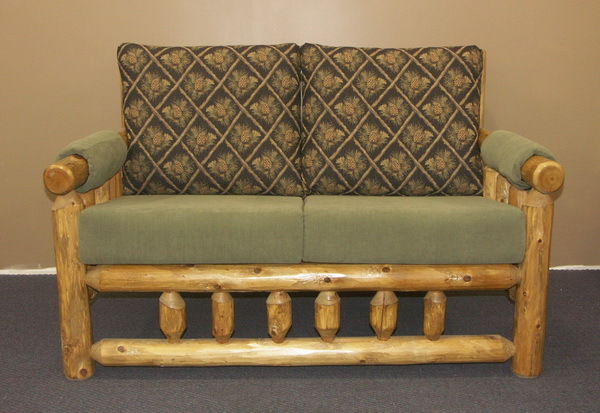 This rustic log patio sofa is made of solid wood construction. It is naturally rot and insect resistant. We allow a five year warranty on construction. Usually ships in 1-2 weeks. Instructions and hardware included. Call us at (866) 744-9913 for more information and shipping. 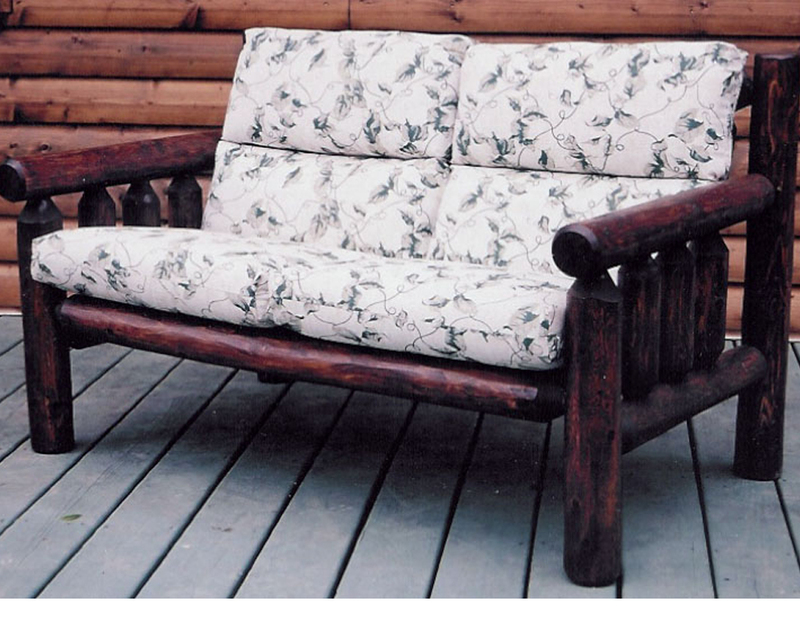 This rustic log patio loveseat is made of solid wood construction. It is naturally rot and insect resistant. We allow a five year warranty on construction. Usually ships in 1-2 weeks. Instructions and hardware included. Call us at (866) 744-9913 for more information and shipping. 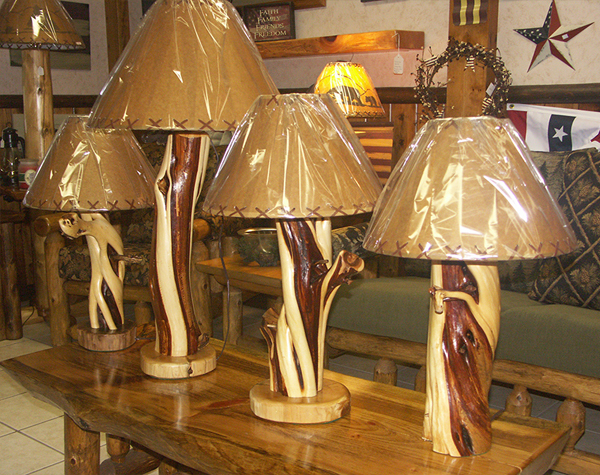 We carry a supply of these beautiful Twisted Juniper Lamps. No two lamps are ever alike. Stop in to our showroom to view the current available selections. 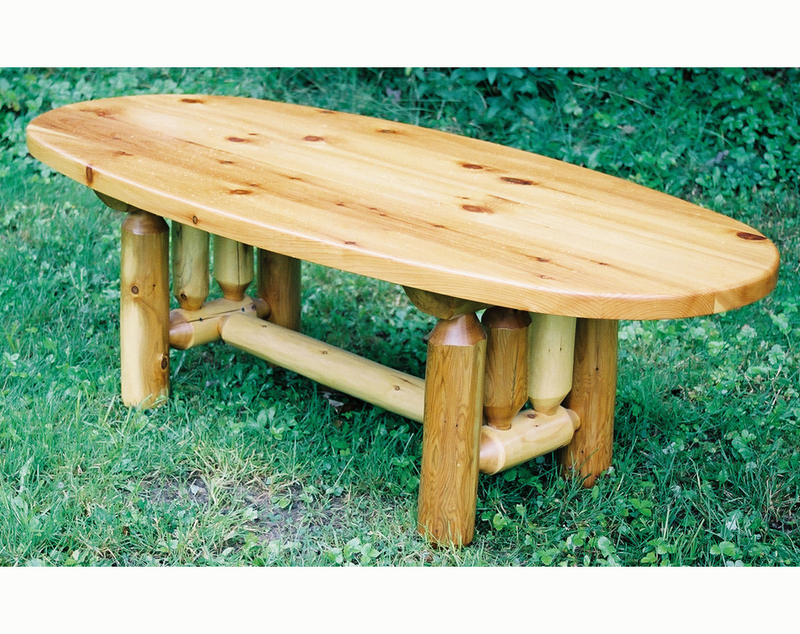 Constructed of White Cedar with a white pine top this table will be the centerpiece in your dining area. 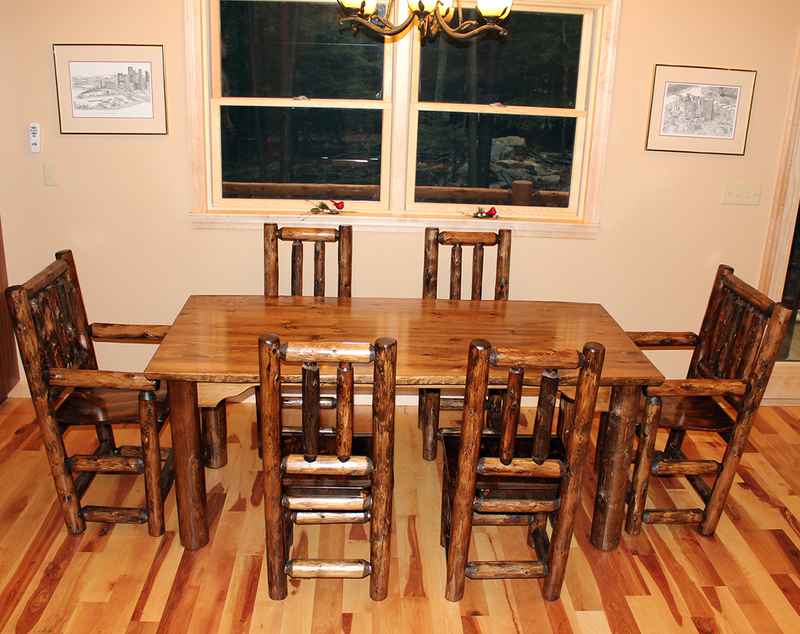 Table comes with 4 high back and 2 captains chairs. 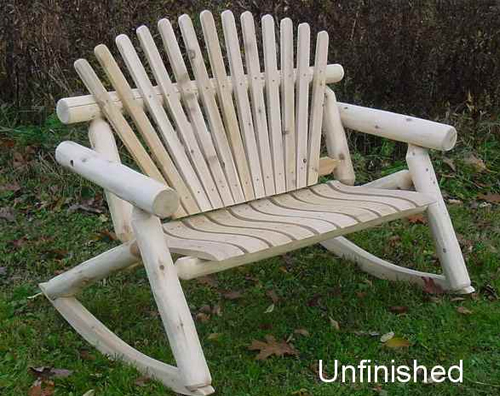 Available unfinished or have us finish it with Minwax stain color of your choice and multiple coats of satin lacquer. Please give us a call to discuss shipping options at (866) 744-9913. Custom tables are also available. Give our knowledgeable sales team a call today! 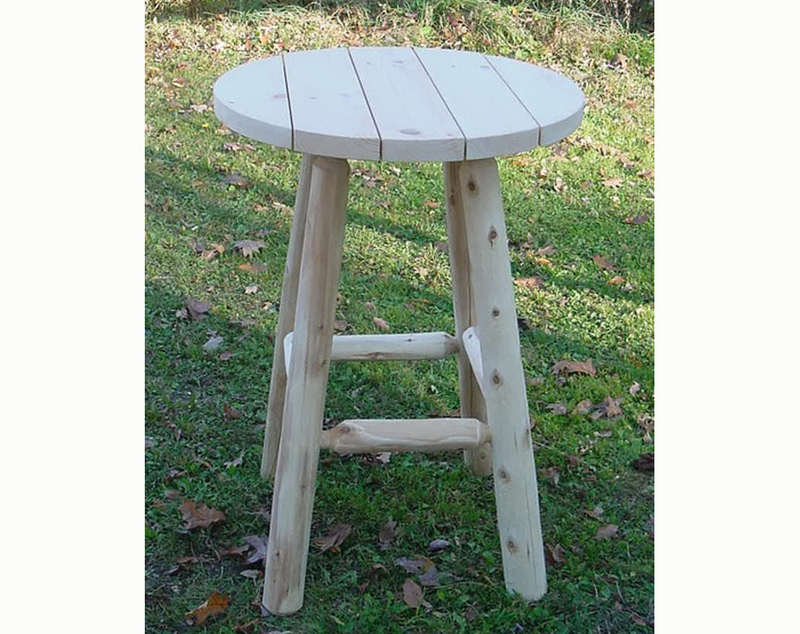 Solid wood construction; Instructions and hardware included. Usually ships in 1-2 weeks. 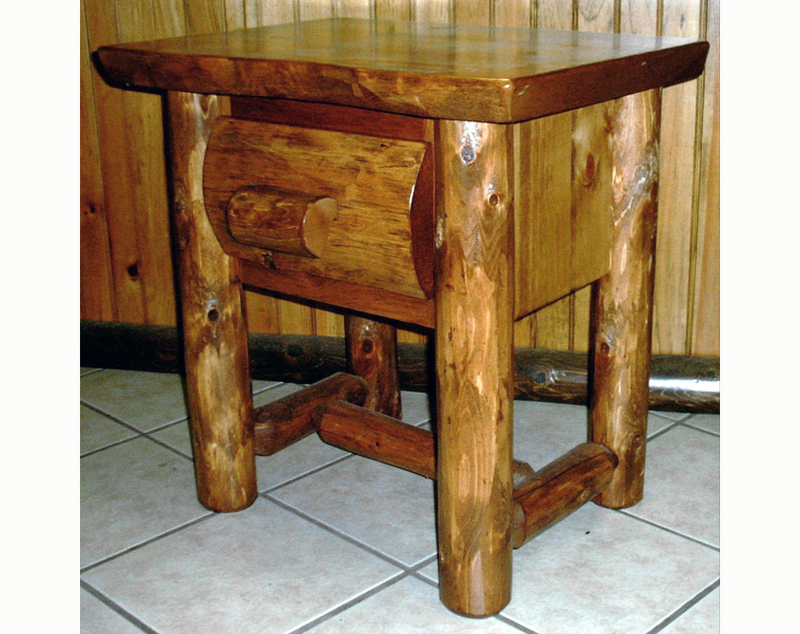 Solid wood construction; Instructions and hardware included. All beds are mortise and tenon construction. 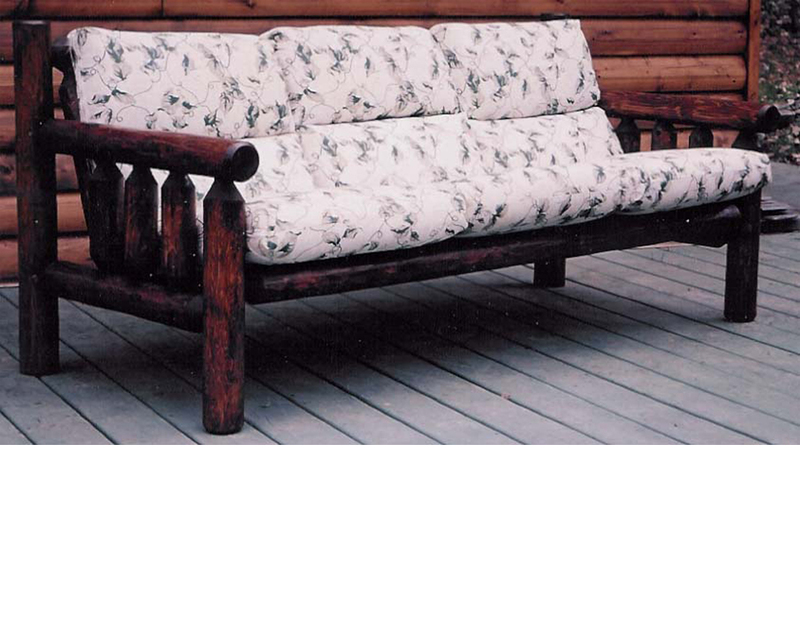 Thick half-log slats tenoned into each rail for years of reliable, rugged good looks. Shipped partially assembled as four pieces. Available unfinished or finished. We finish with Minwax Colors and seal with satin lacquer finish. 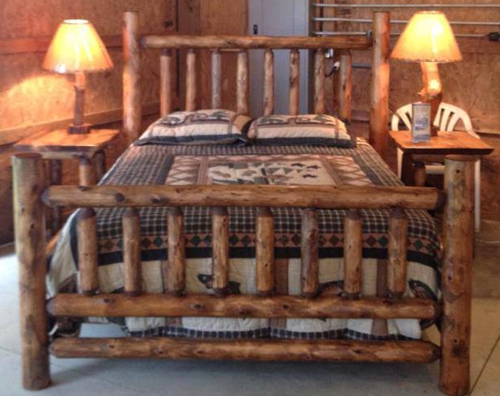 Custom beds are available. Call us at (866) 744-9913 for more information and shipping. 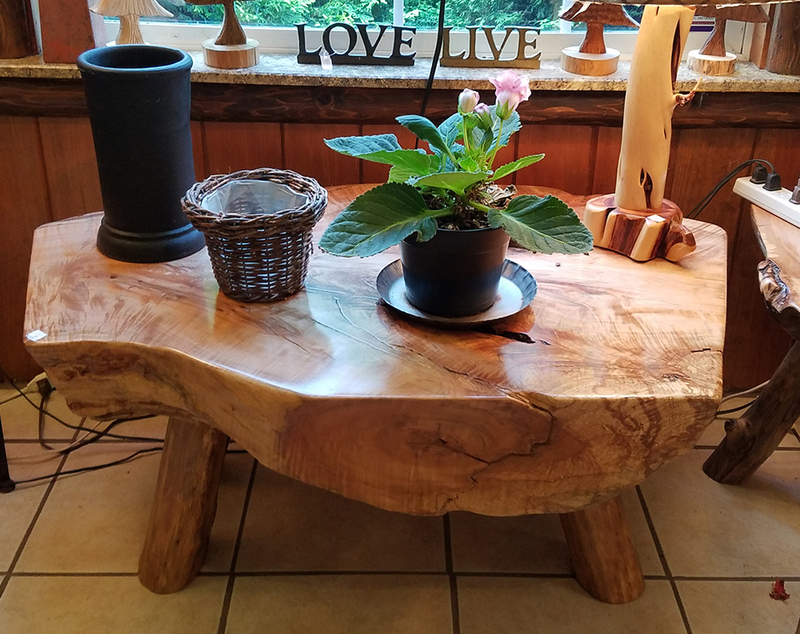 Each half log bench is unique, choose unfinished or pick one of the Minwax colors to really bring out the beauty of this table. Available unfinished or finished. We finish with Minwax™ Colors and seal with satin lacquer finish. Call us at (866) 744-9913 for more information and shipping. 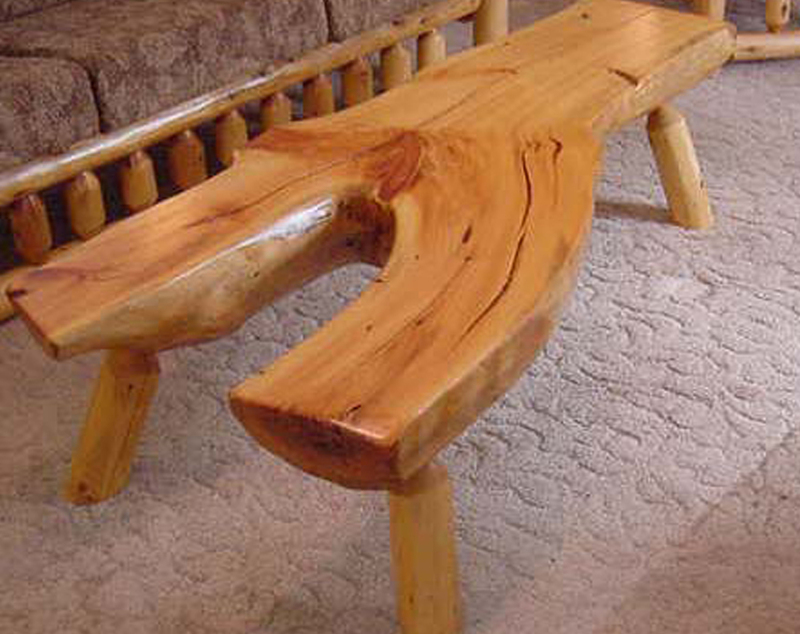 This hand carved bench will be sure to draw attention. Perfect for the entry way. Call us at (866) 744-9913 for more information and shipping. 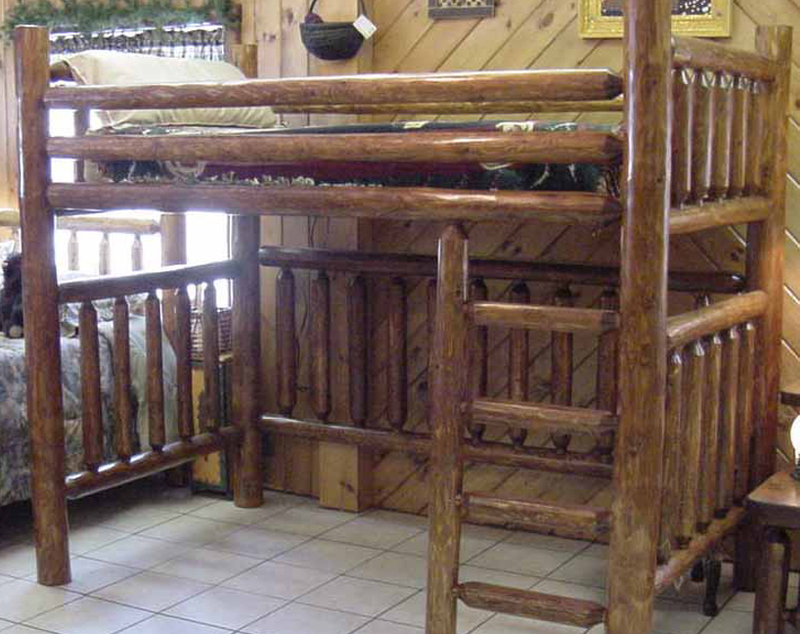 Sturdy, rugged log construction adds to the durability of our bunk beds. So let ’em be cowboys and cowgirls! 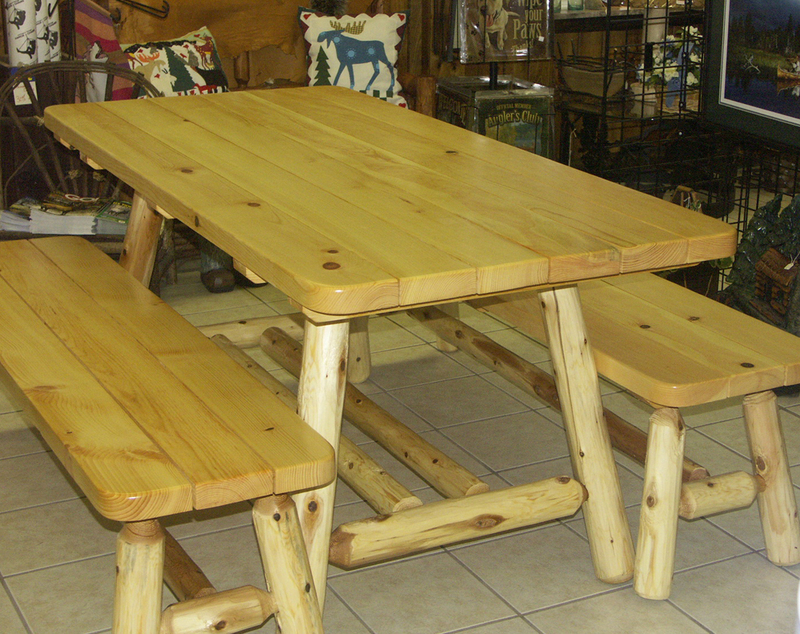 Constructed solid wood this table will be the centerpiece in your dining area. 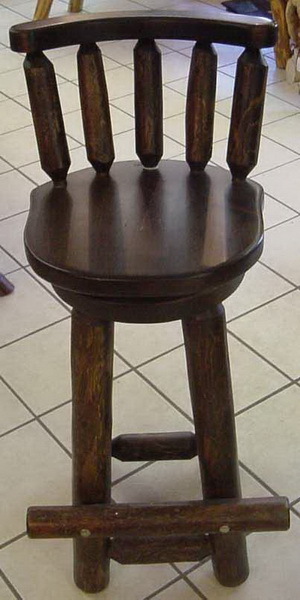 Table comes with 4 high back chairs. Available unfinished or have us finish it with Minwax stain color of your choice and multiple coats of satin lacquer. Please call us at (866) 744-9913 for more information or for shipping options. Custom tables are also available. Give our knowledgeable sales team a call today! 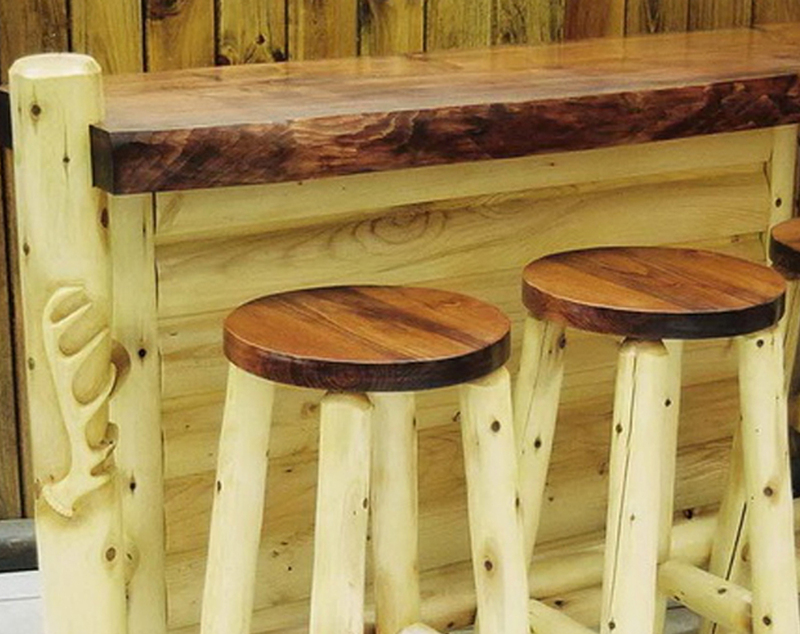 Let us custom build a bar for you. Call us at (866) 744-9913 for more information and for shipping options. 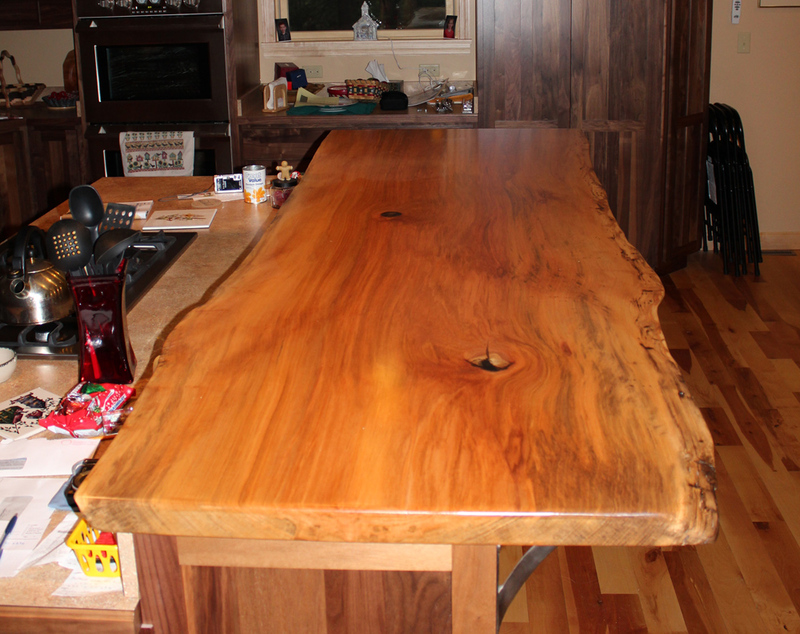 This beautiful kitchen table is constructed of white cedar and white pine. 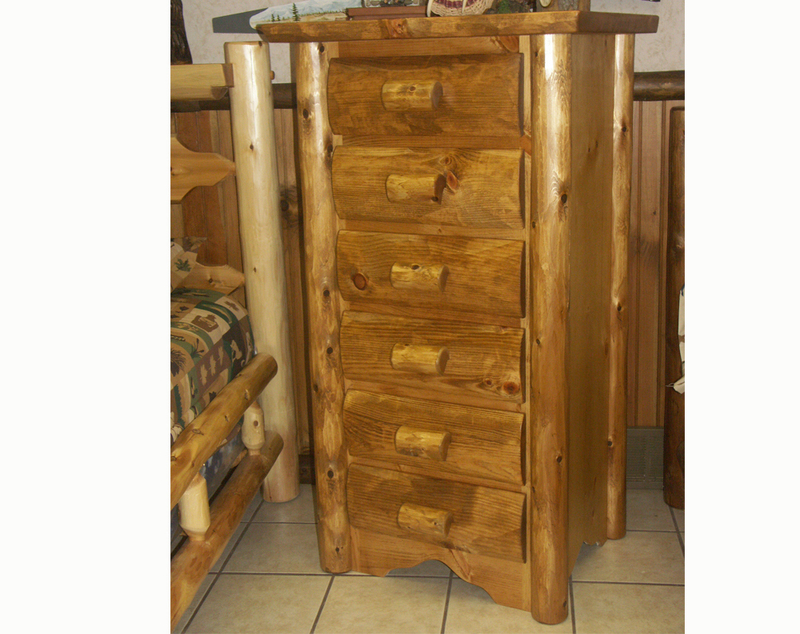 Features a 2″ thick top and includes 2 Captain’s chairs and 2 High back chairs. Table is available unfinished or have us finish it with a Minwax stain color of your choice and multiple coats of satin lacquer. Please call us at (866) 744-9913 for more information or for shipping options. 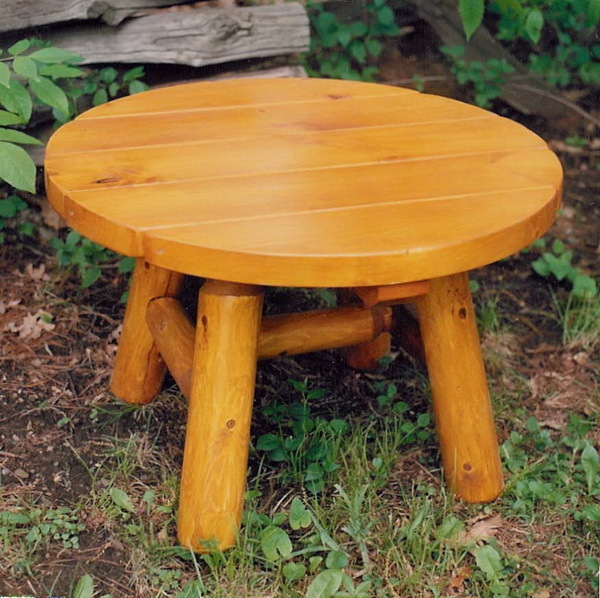 This rustic log child’s table and chairs are made of solid wood construction. It is naturally rot and insect resistant. We allow a five year warranty on construction. Usually ships in 1-2 weeks. Instructions and hardware included. Call us at (866) 744-9913 for more information. This is just an example of the many framed artwork prints that we carry in the store. 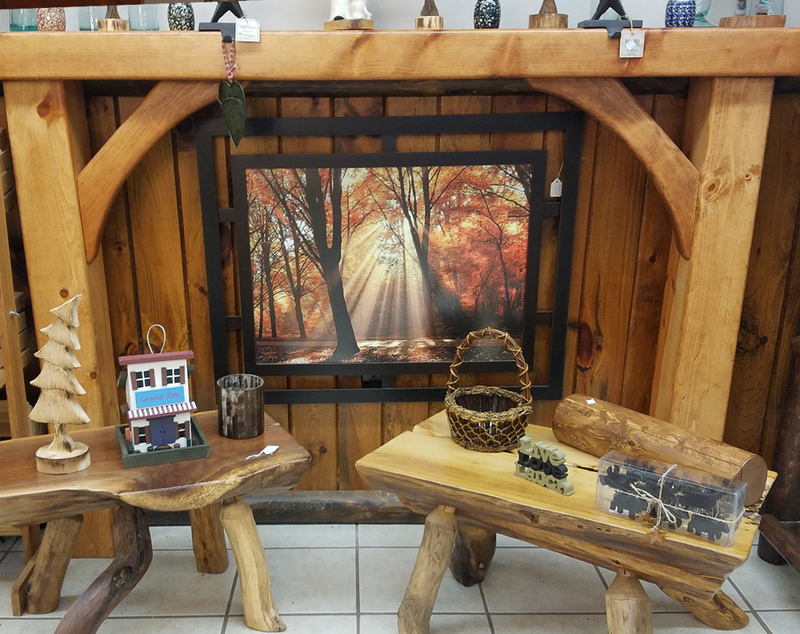 Our selection changes often, so please stop by if you are looking for nature or rustic art for your walls. 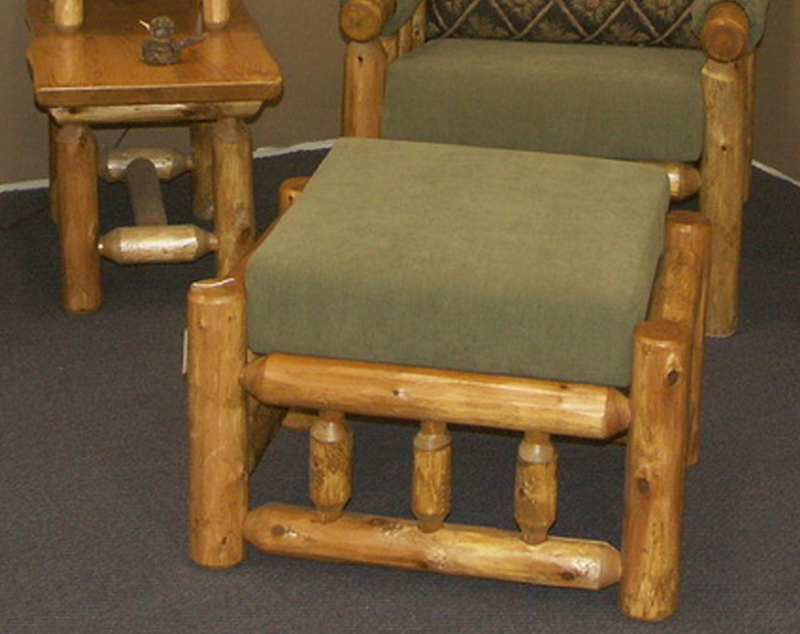 White cedar log leg construction with a white pine top is a great compliment to a pair of chairs or rockers. Instructions and hardware included. Ships in 3-5 days. This product ships partially assembled and includes hardware and instructions. Approx. assembly time is 15-20 min. 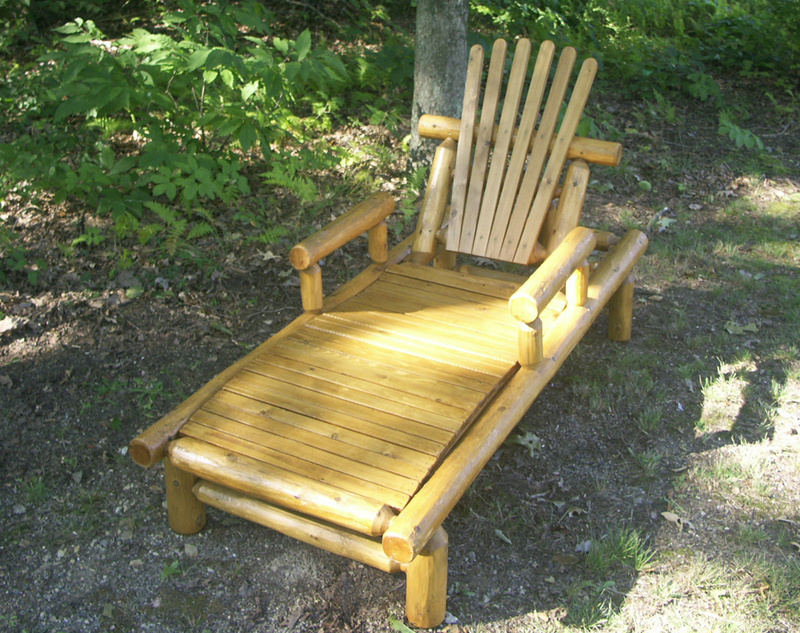 White cedar log construction; A great compliment to a pair of chairs or rockers. Instructions and hardware included. 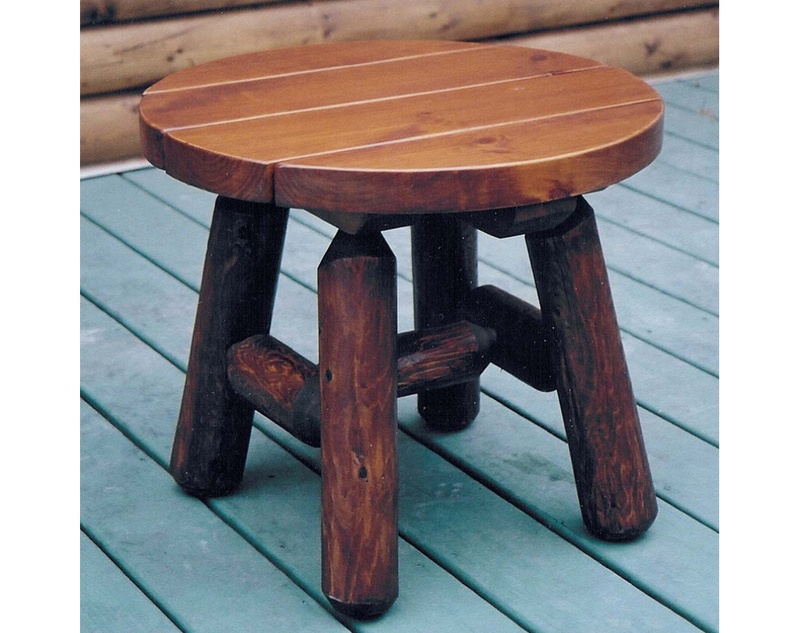 Built from white cedar and featuring a contoured seat, this is a great addition to any rustic setting. Please call for shipping options at (866) 744-9913. 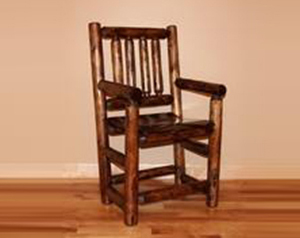 Our high back chairs are made from white cedar and feature a contoured seat for comfort. Available finished or unfinished. Call us at (866) 744-9913 for more information and shipping. 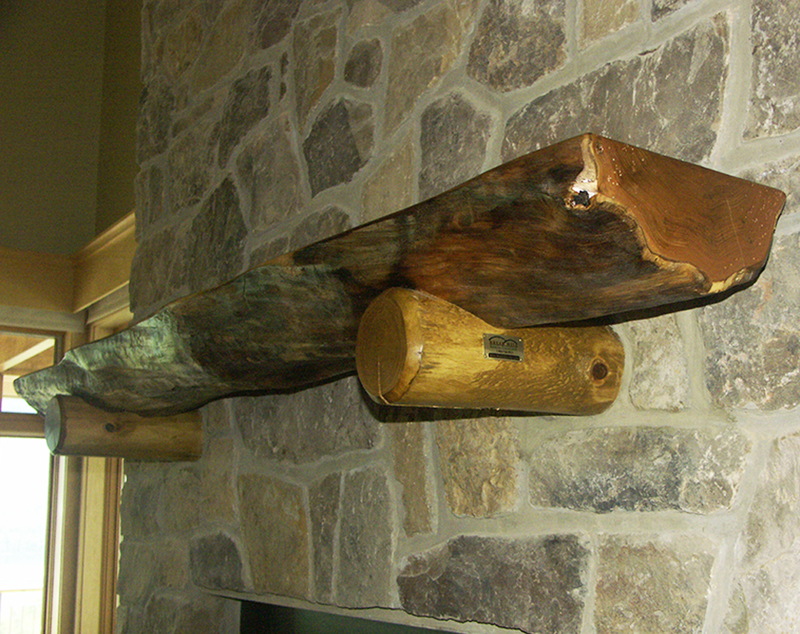 This Butternut Mantle is on display at Bald Eagle State Park in central Pennsylvania. Please call us at 866-744-9913 for availability. Classic railing with notched posts. 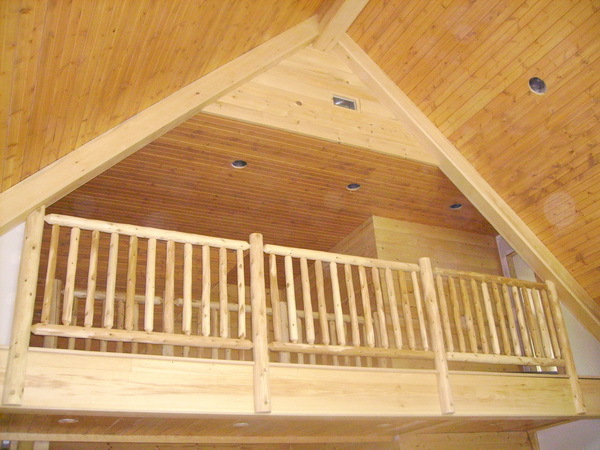 Call us at (866) 744-9913 for more information on custom railings. 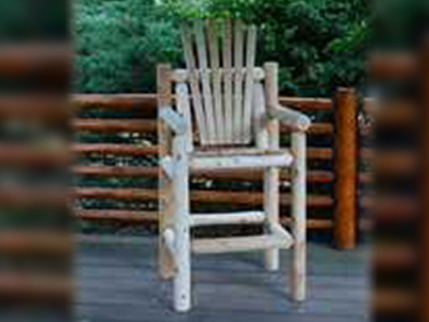 Made from white cedar, these captains chairs go great around the pool or on the deck. Call us at (866) 744-9913 for more information and for shipping options. This is a custom fireplace mantle that can be designed to fit your needs. 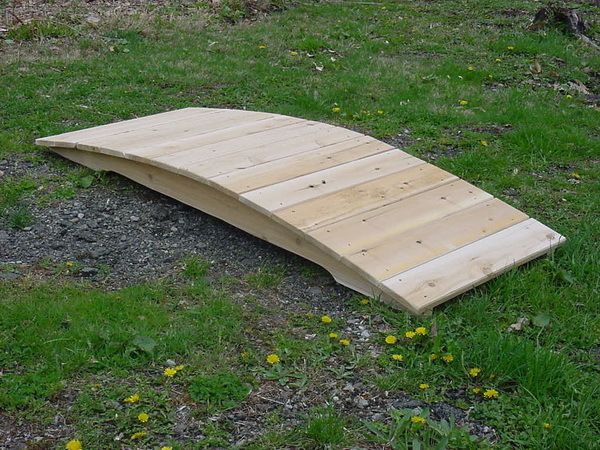 We have a great selection of air dried white pine so you can get that perfect look. Please give us a call for more information about this product or to discuss shipping options at (866) 744-9913. 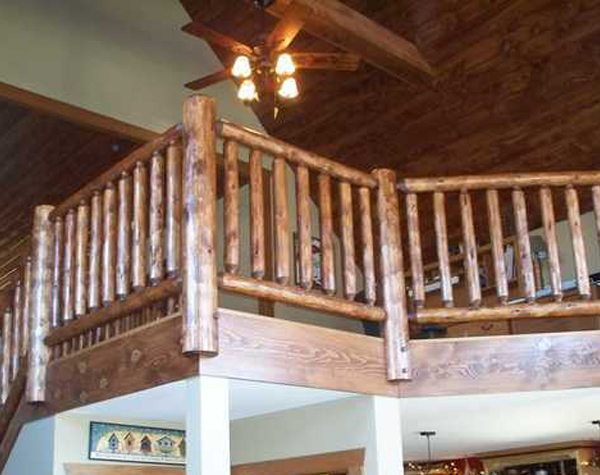 This traditional railing was stained to match the interior. We used notched post and added a handrail to meet code. Please call for more information at 1-866-744-9913. 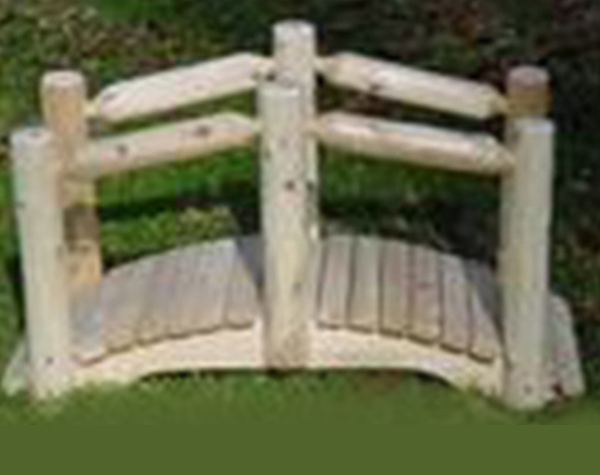 Traditional railing with notched post. Please call for more information at (866) 744-9913. 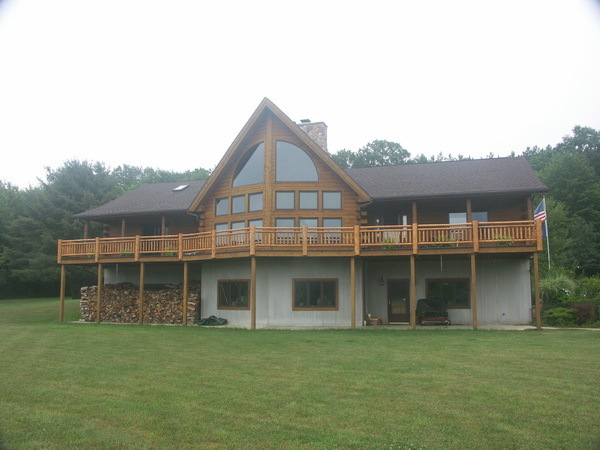 The traditional railing on this wrap around deck really changed the look of the house. Please call for more information at (866) 744-9913. 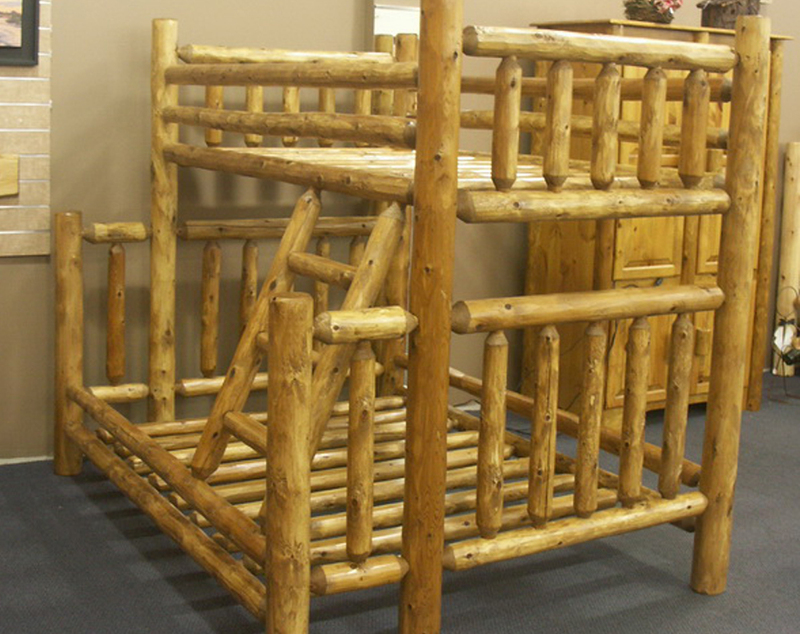 Sturdy, rugged log construction adds to the durability of our bunk beds. So let ’em be cowboys and cowgirls! Call us at (866) 744-9913 for more information and shipping. Please see our interior colors. 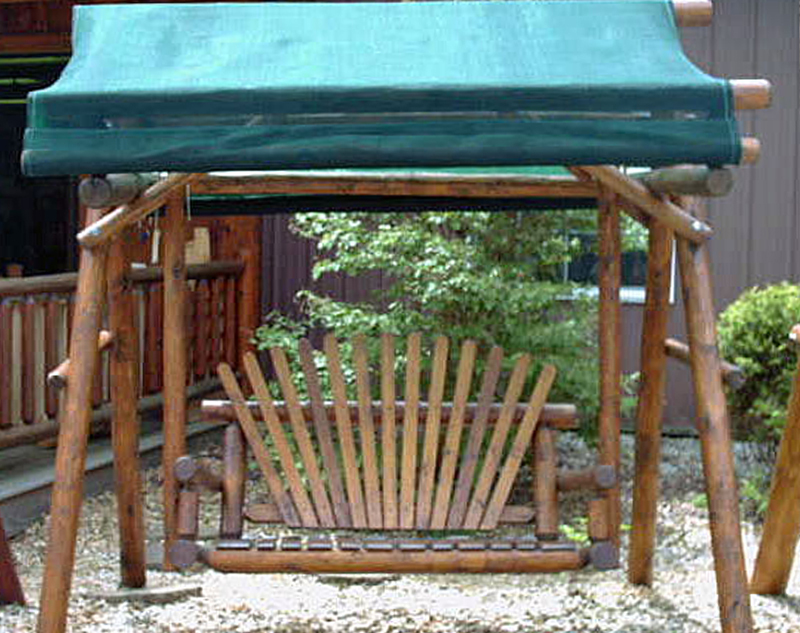 Frame is constructed of cedar logs. Available unfinished or finished. We finish with Minwax Colors and seal with satin lacquer finish. Call us at (866) 744-9913 for more information and shipping. Please see our interior colors. 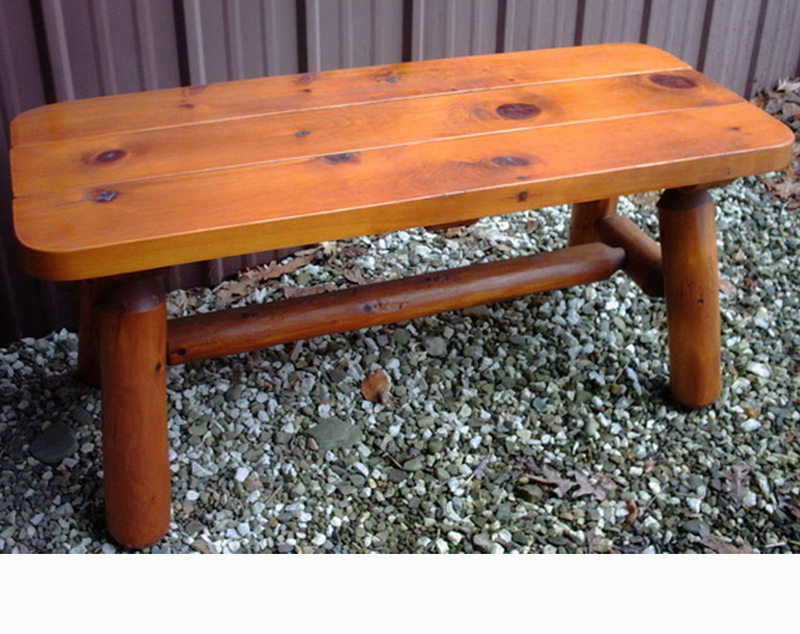 Cedar log framework with a white pine top, available unfinished or finished. We finish with Minwax colors and seal with satin laquer finish. Please call for shipping information at (866) 744-9913. Assembled Dimensions: 48″ W x 17″ D x 28″ H.
A great centerpiece for any room. Please call us at (866) 744-9913 for more information and shipping. Traditional railing. Please call for more information at (866) 744-9913. This is a great addition to any game room or patio. 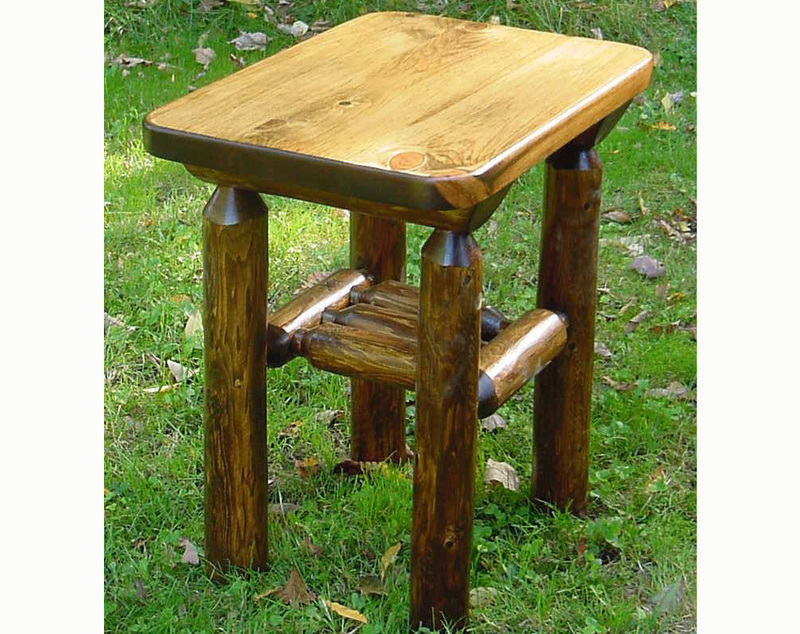 This pub table can be finished for use inside or out. Call us at (866) 744-9913 for more information and for shipping options. 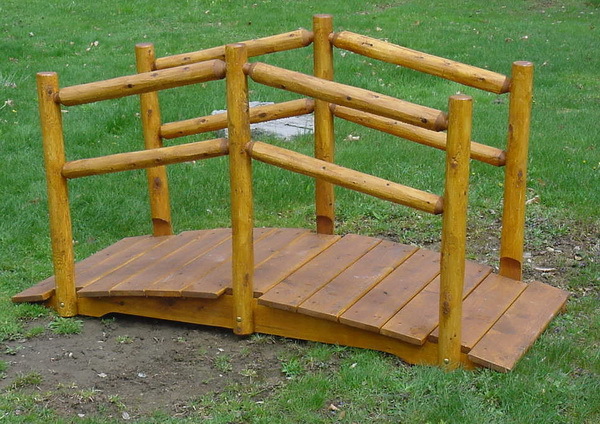 Porcupine railing with notched posts. Please call for more information at (866) 744-9913. 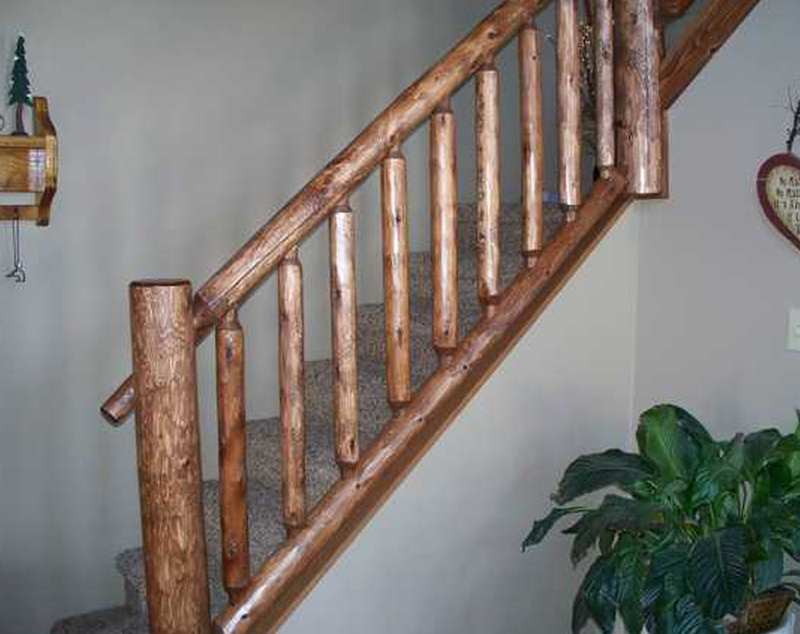 Traditional railing with notched posts. Please call for more information at (866) 744-9913. 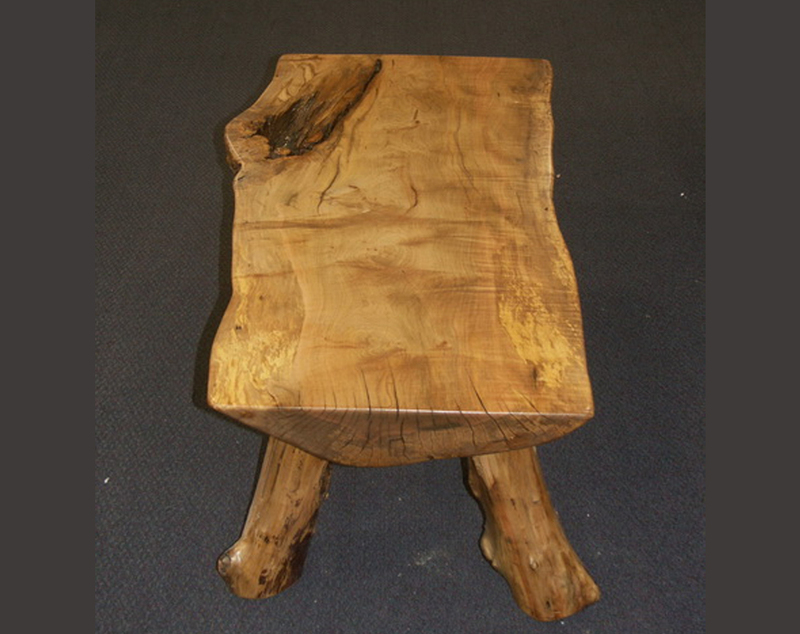 This is a great example of the one of a kind benches and tables that we make. This piece of boxed elder had some great character. Call us at (866) 744-9913 for more information and shipping. 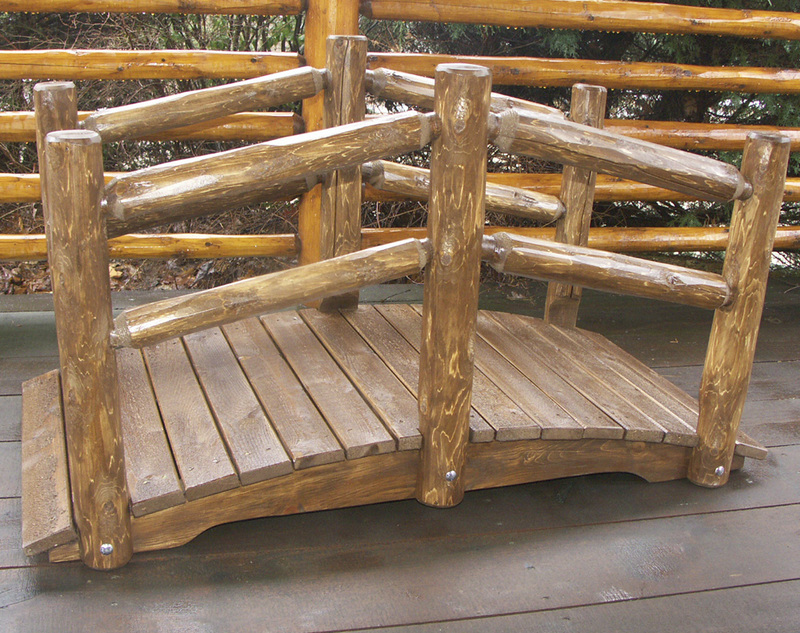 Classic Railing with custom 8″ notched posts. Please call for more information at (866) 744-9913. If character is what you are looking for this is your piece. This is a 6″ slab of twisted Juniper with custom supports. Each piece takes on a character of its own and are definitely one of a kind. 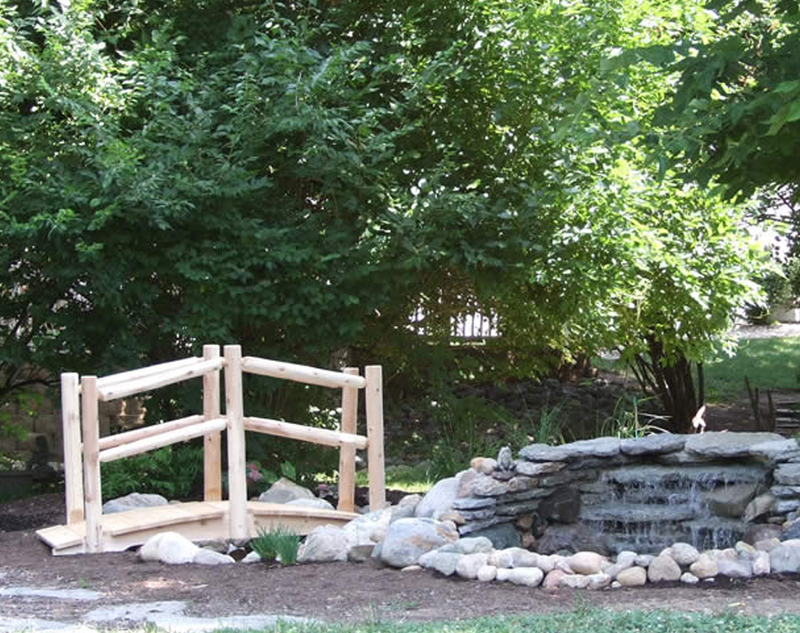 Browse through the pictures to see how this was built. Call us at (866) 744-9913 for more information. Unsigned, open edition from the Studio Canvas Collection. Image size, 18″ x 25″. 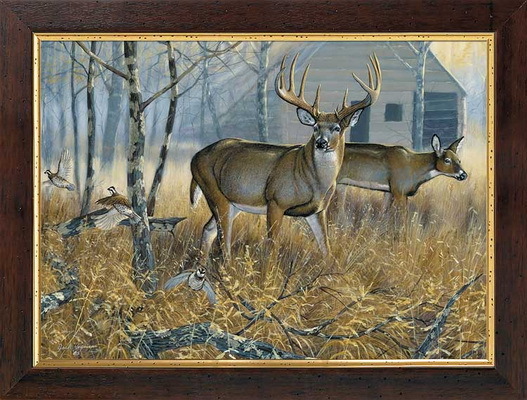 Framed size, 22″ x 29″ with 2-1/4″ lightly distressed, medium oak-stained hardwood moulding with gold inner lip. 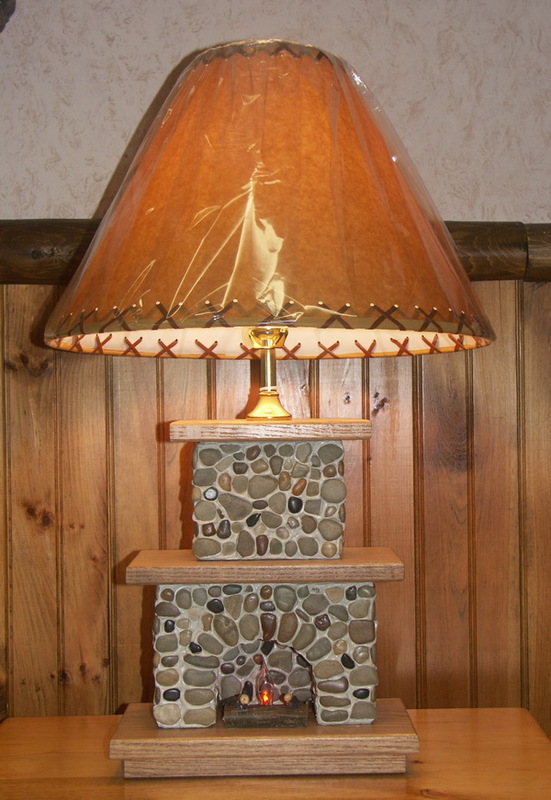 This lamp is made from real stone! And the wooden base, mantel and top are solid oak lumber. There is a flicker flame bulb in the fireplace that gives off a warm glow like a real fireplace and is even stoked with firewood. Both lights are controlled by one switch, The first click turns on the fireplace bulb only, the second click turns on the top lamp only, the third click turns on both lamps. Handmade in western Pennsylvania. Includes shade and flicker bulb for fireplace. Free Shipping! 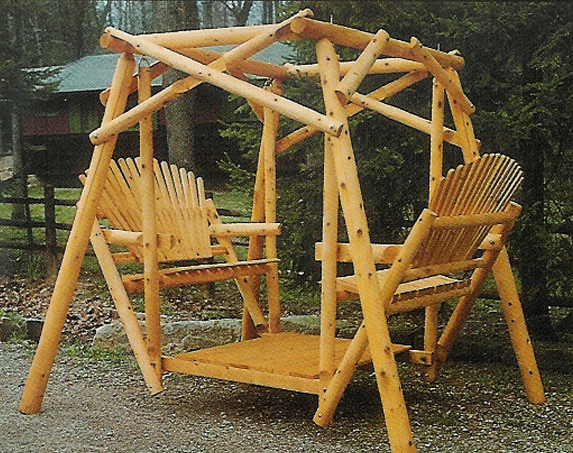 Solid white cedar construction; Instructions and hardware included.Usually ships in 1-2 weeks. 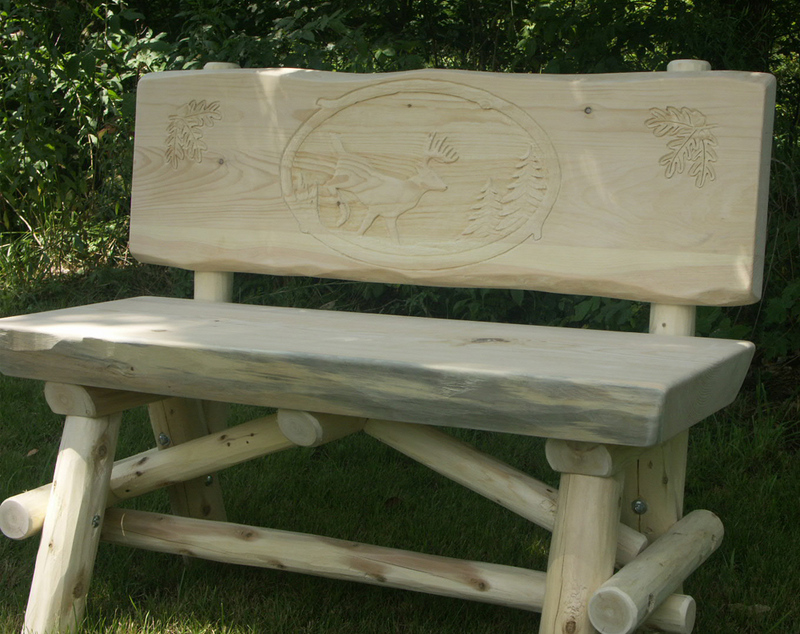 This northern white cedar log bench is the perfect place to share those special moments with family or friends. 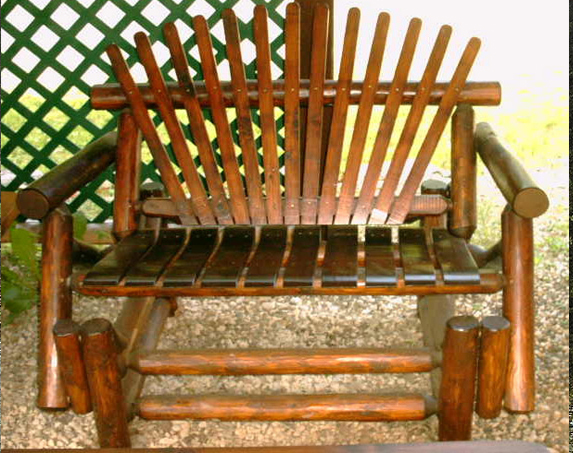 Whether you place this bench in your flower garden, backyard hideaway or any other distinctive area, enjoyment will be yours for years to come. Instructions and hardware included. Usually ships in 1-2 weeks. Have a room that needs a little more storage? Check out this corner dresser with some display shelves. Please call for shipping information at (866) 744-9913. 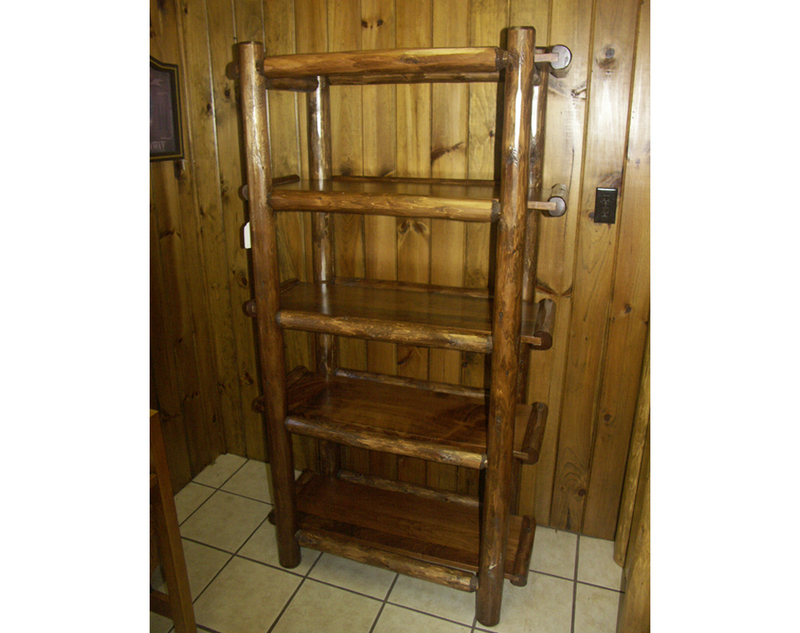 Constructed of cedar logs this baker’s rack will be the focal point of your dining area. Available unfinished or have us finish it with Minwax stain color of your choice and multiple coats of satin lacquer. Please call us at (866) 744-9913 for more information or for shipping options. This is a great compliment piece to any bedroom. We use dovetail joinery on our drawers. Available unfinished or finished. We finish with Minwax Colors and seal with satin lacquer finish. Call us at (866) 744-9913 for more information and shipping. 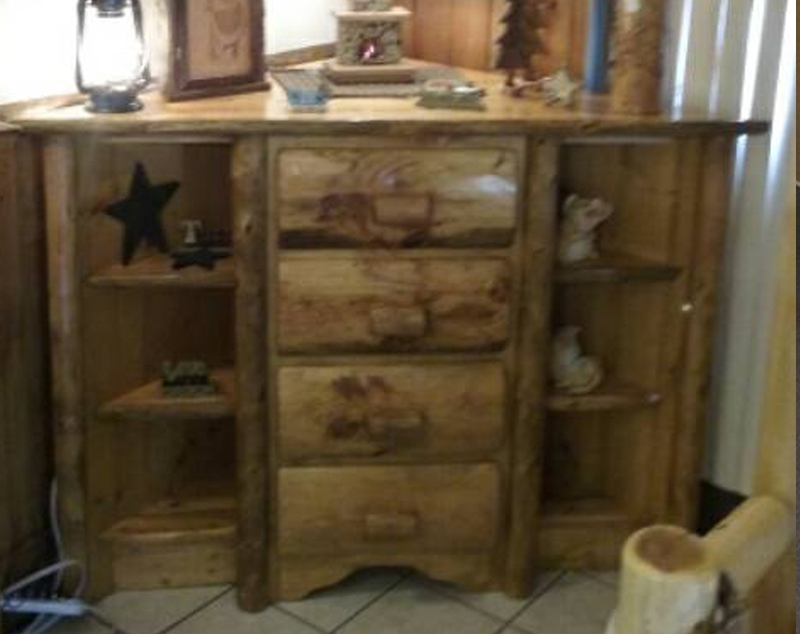 This beautiful dresser is built to last. Available unfinished or finished. We finish with Minwax Colors, and seal with satin laquer finish. Call us at (866) 744-9913 for more information and shipping. 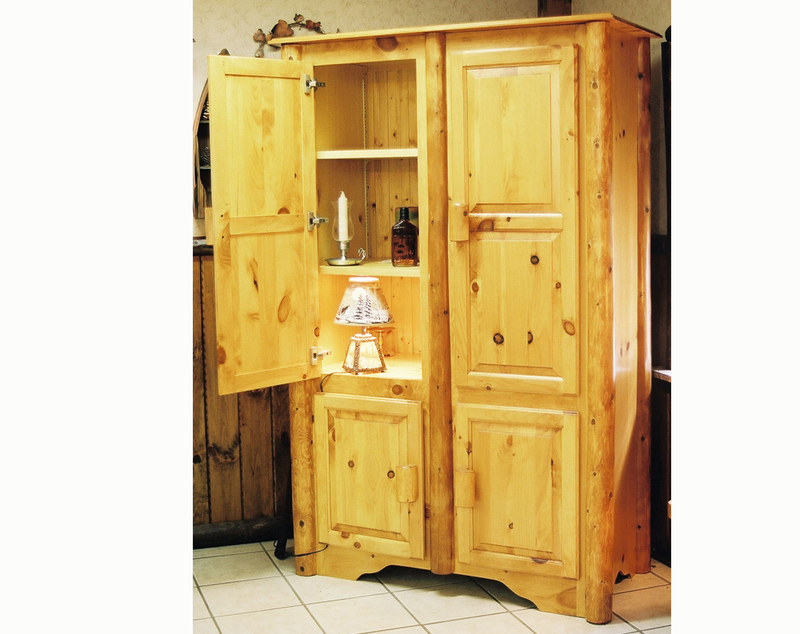 Knotty white pine case is accented with white cedar logs. Dovetailed drawers highlight this dresser. Available unfinished or finished. We finish with Minwax Colors, and seal with satin laquer finish. Call us at (866) 744-9913 for more information and shipping. 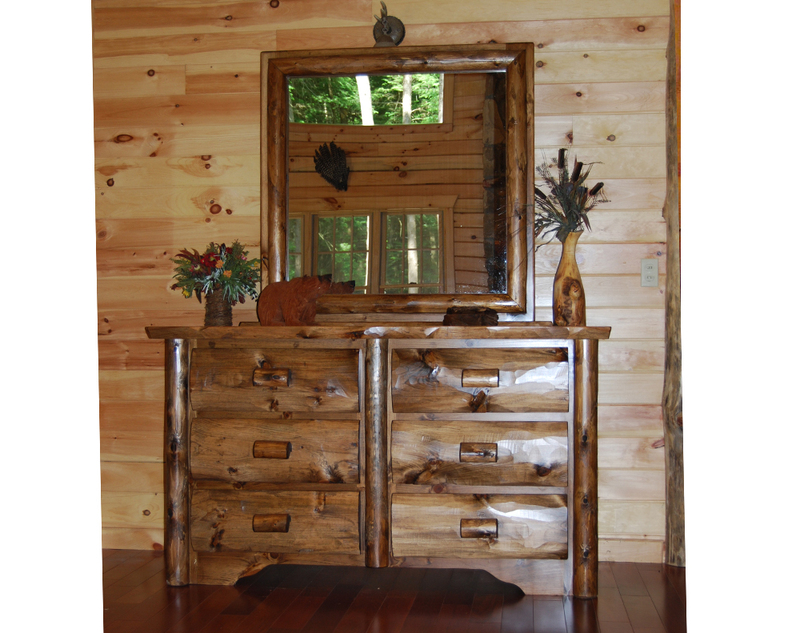 Knotty white pine case is accented with white cedar logs. 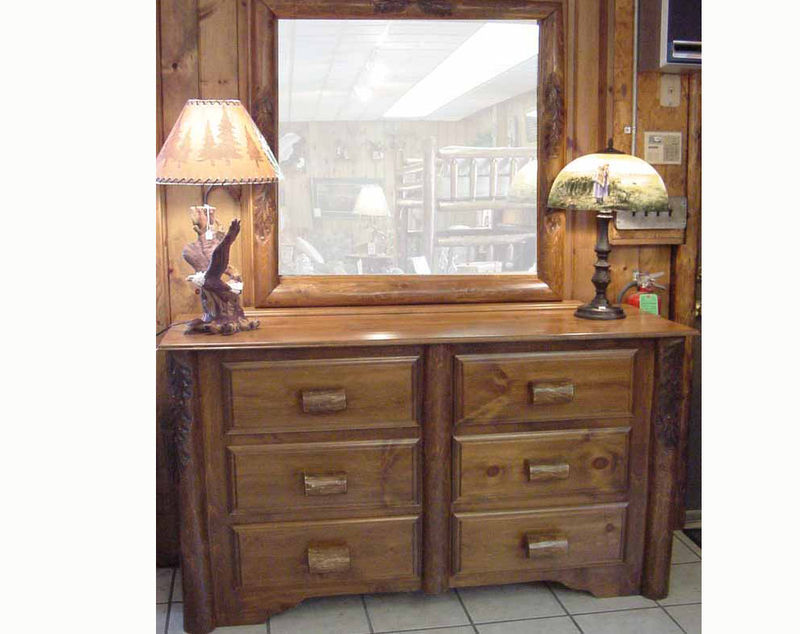 Draw knife drawer fronts and dovetailed drawers highlight this dresser. Available unfinished or finished. We finish with Minwax Colors, and seal with satin laquer finish. Call us at (866) 744-9913 for more information and shipping. 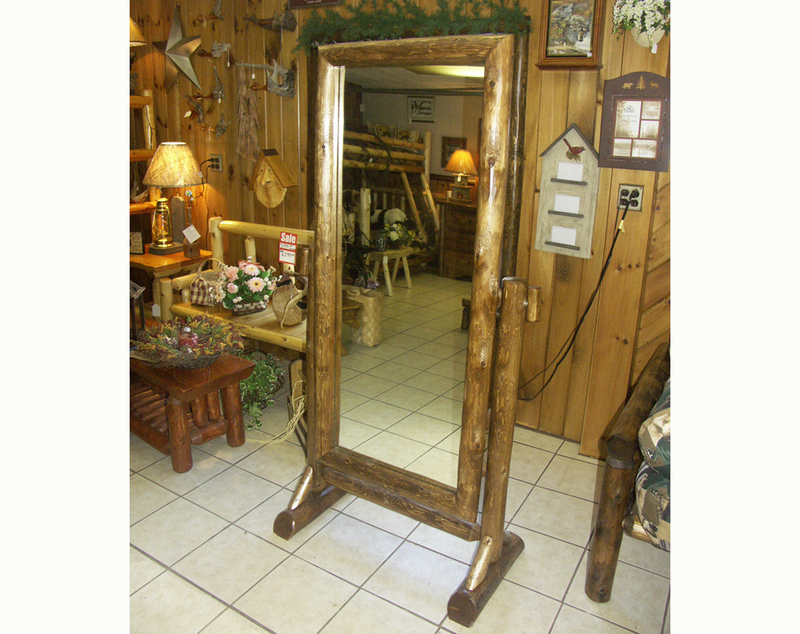 A perfect full length mirror for your rustic setting. Available unfinished or finished. We finish with Minwax Colors and seal with satin lacquer finish. Call us at (866) 744-9913 for more information and shipping. 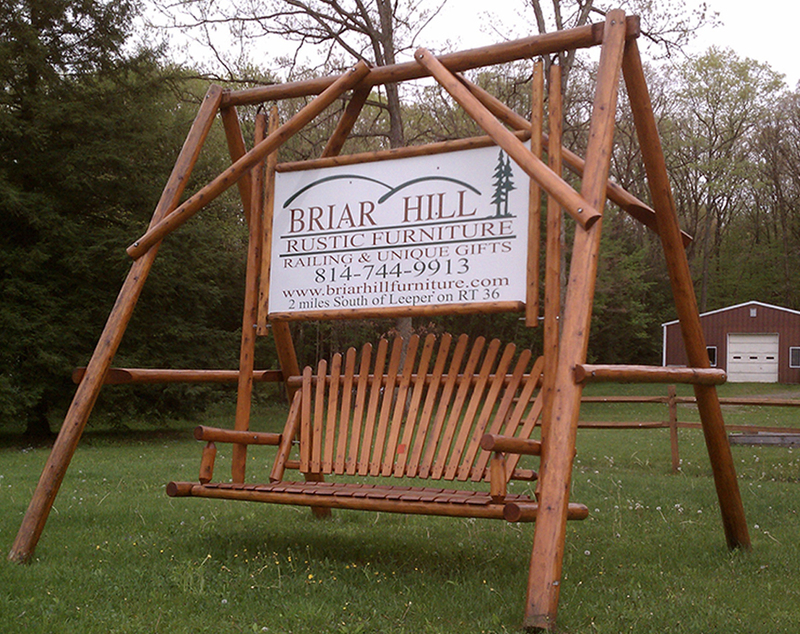 Frame is constructed of cedar logs with a white pine top. Available unfinished or finished. We finish with Minwax Colors and seal with satin lacquer finish. Call us at (866) 744-9913 for more information and shipping. This is a great compliment to one of our beds. We use dovetail joinery on our drawers. Available unfinished or finished. We finish with Minwax Colors, and seal with satin lacquer finish. Call us at (866) 744-9913 for more information and shipping.